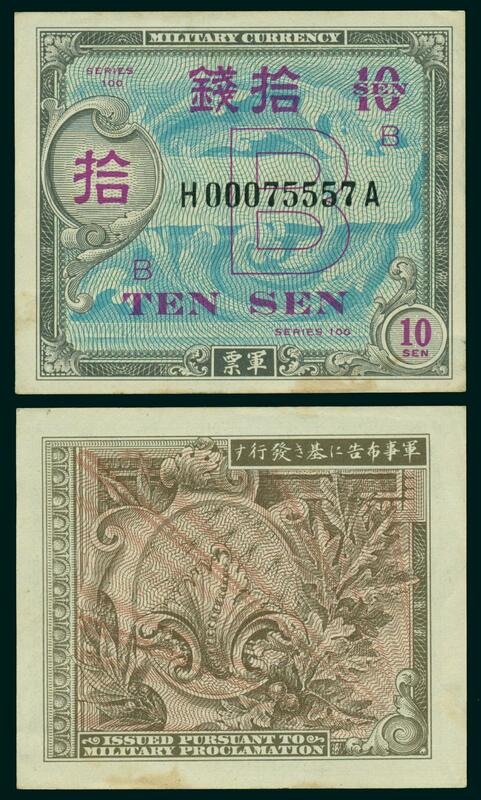 10s, 50s, 1y A-A, B-B, C-C & D-D, 5y A-A & B-B, 10y, 20y, 100y, 1000y E-E.
"Specimens of Military Yen Currency, Area B"  B-Yen Booklet. 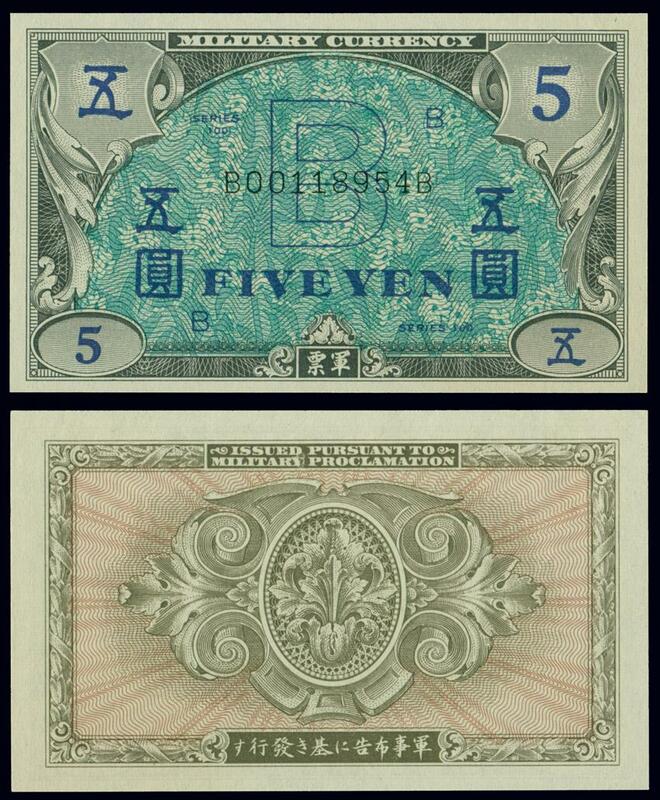 at the left side of each note. 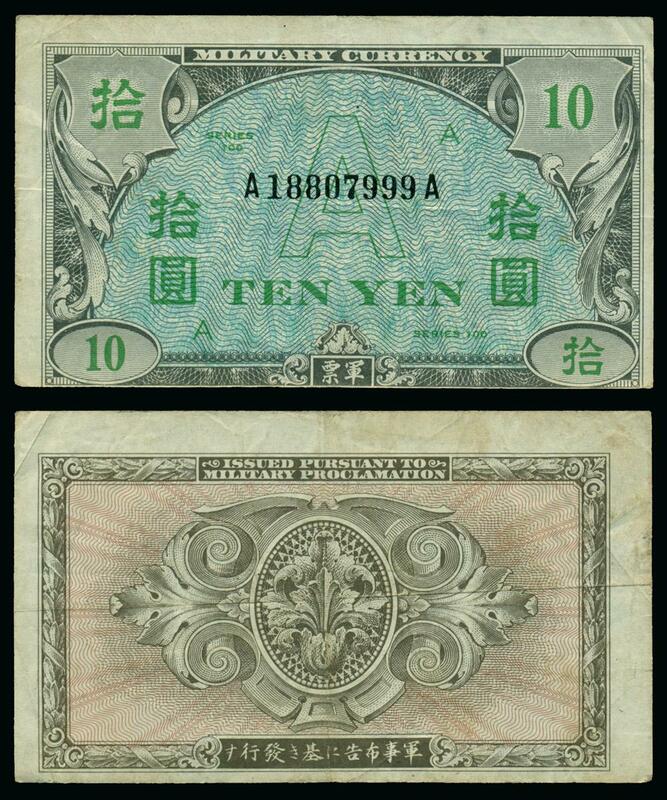 All notes are crisp uncirculated. 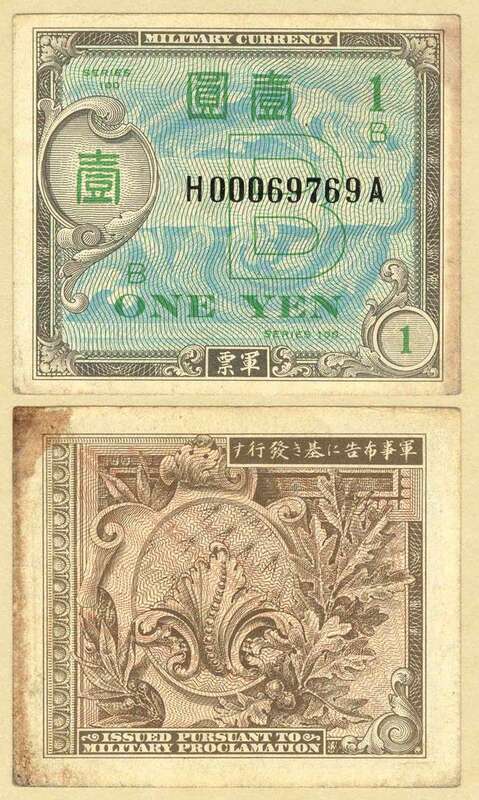 consecutive serial numbers. 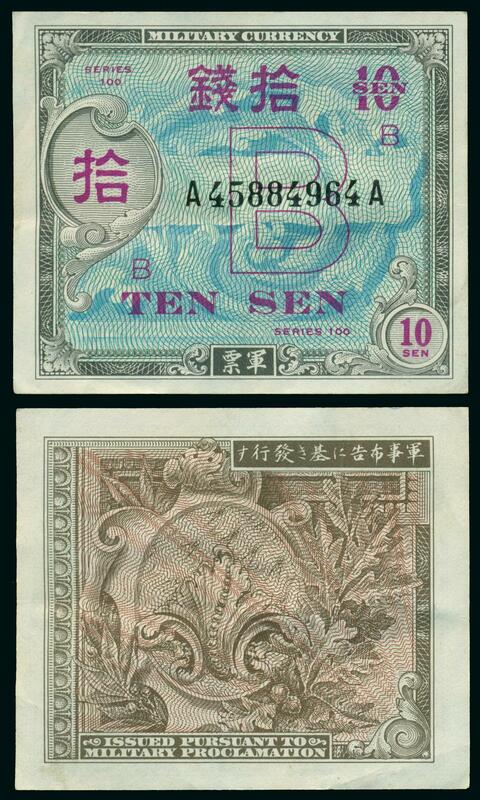 The 10s pack has two replacement notes. 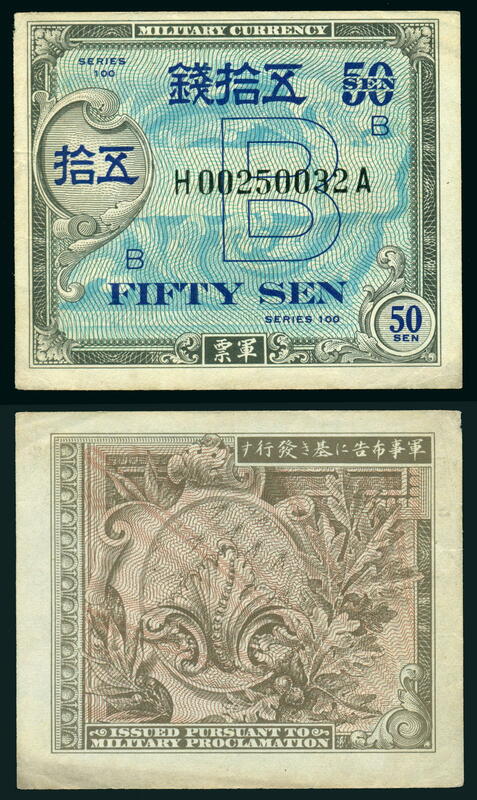 Consecutive Serial #s, Pick P63. 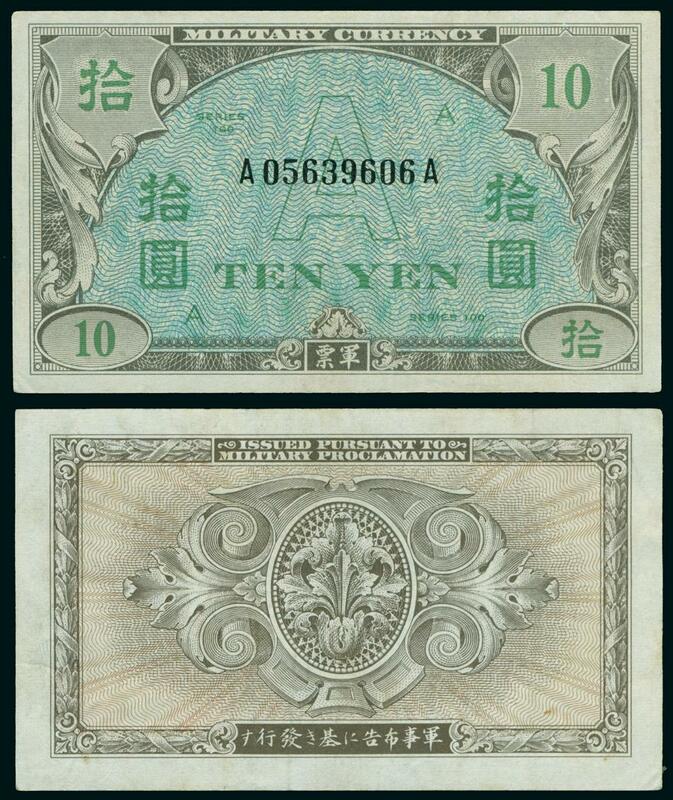 Replacement Note - H00102539A            Price: $285.00    Exceptional Paper Quality"
B-Yen, 1 yen, H-A, Extra Fine, thick number "2"
B-Yen, 5y, H-A, AU, PMG 50  "About Uncirculated"
Replacement Note - H00048777A                      Price: $475.00    Exceptional Paper Quality"
Uncirculated (UNC - CU) [ ] - Perfect. 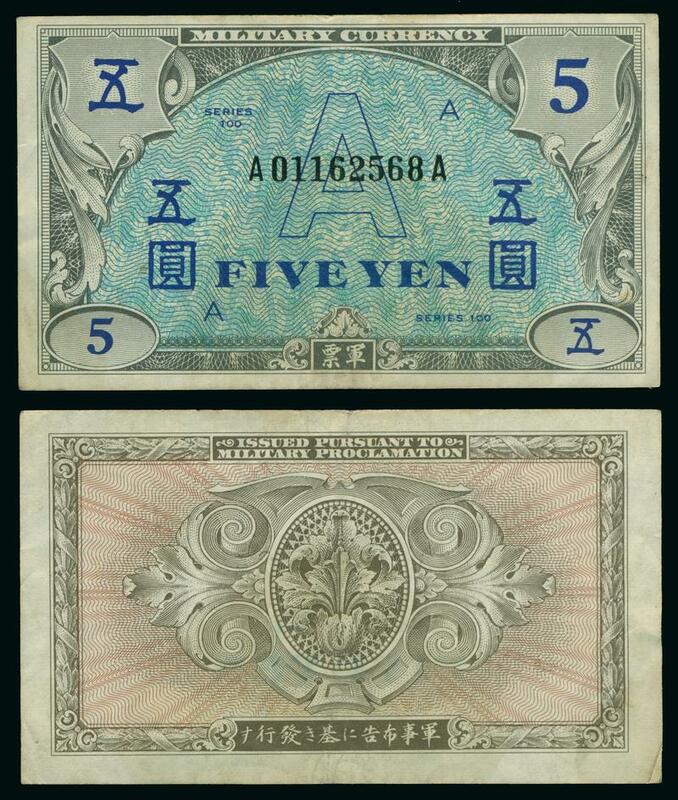 About Uncirculated (AU) - Slight evidence of handling. 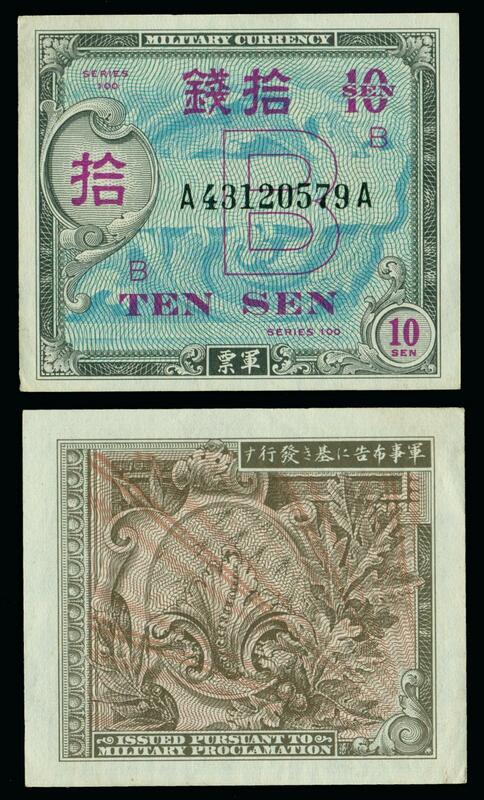 Extremely Fine (XF or EF) - Clean and bright but with light handling, no more than 3 light folds or one strong crease. 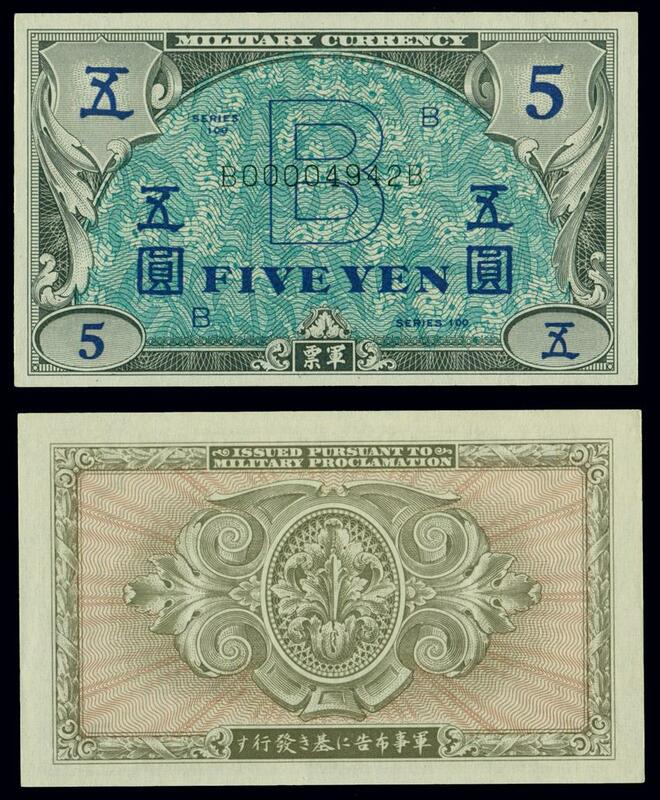 Very Fine (VF) [ ] - Light soiling but note is crisp. May have several folds. No tears. 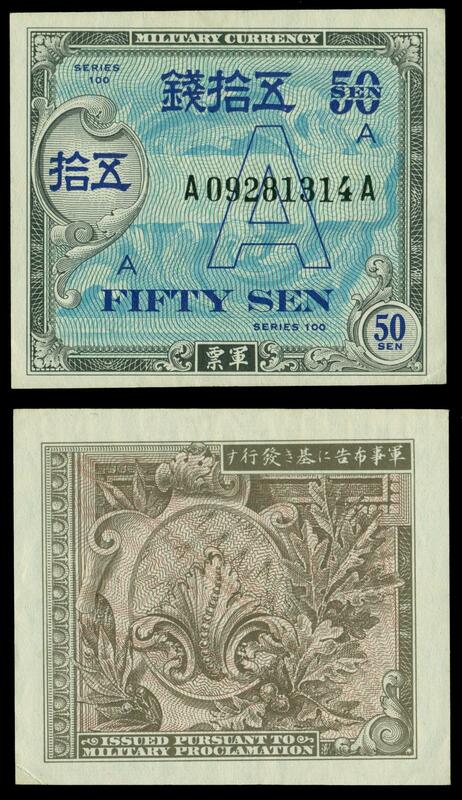 Corners may be slightly rounded. Fine (F) [ ] - Considerable signs of circulation, soiling, edge tears not extending into design, no holes. Very Good (VG) - Extensive signs of circulation, heavy soiling, creases, strong folds, may have hole in center from folding. Good (G) - Well worn/used, overall unattractive appearance. 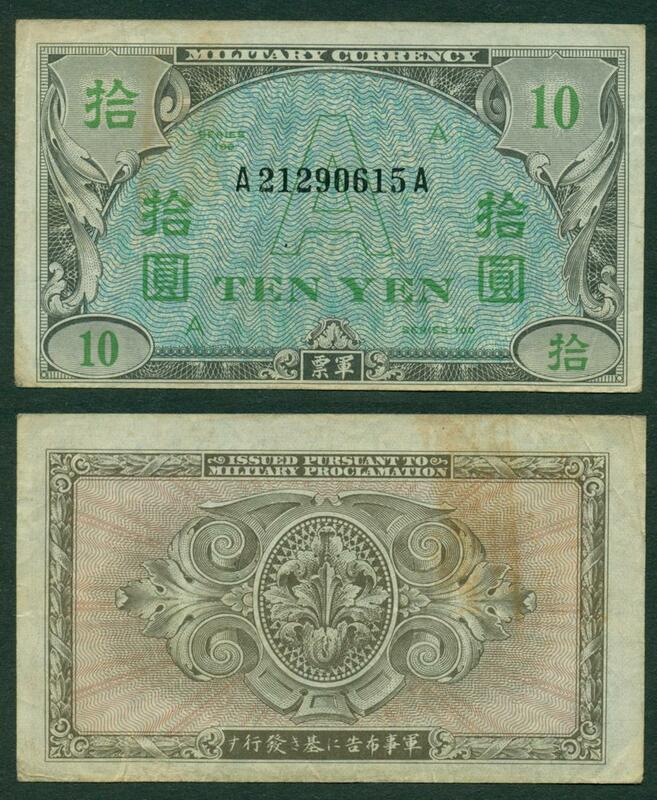 Some notes offered on this webpage have been graded by the Professional Money Guaranty (PMG), a commercial grading firm. For detailed information on PMG grades, click here. 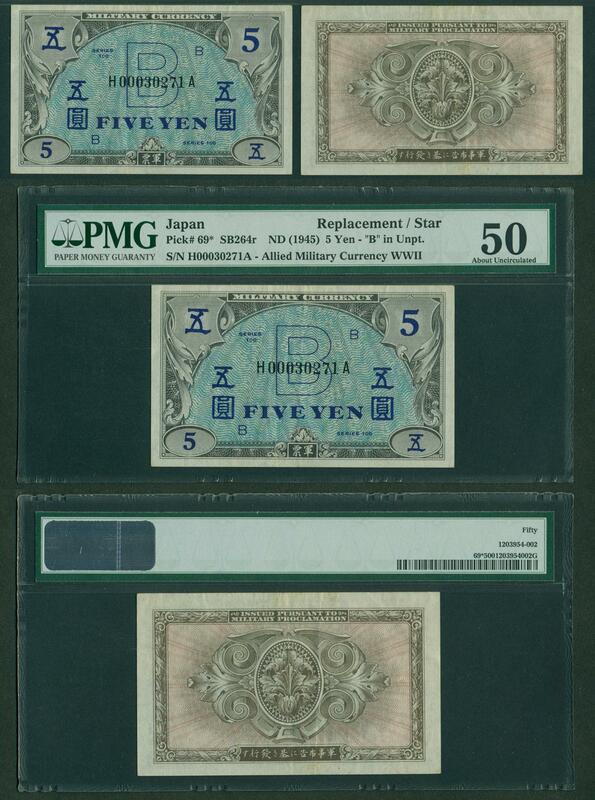 Currently the minimum PMG charge for grading a note is $25.00. 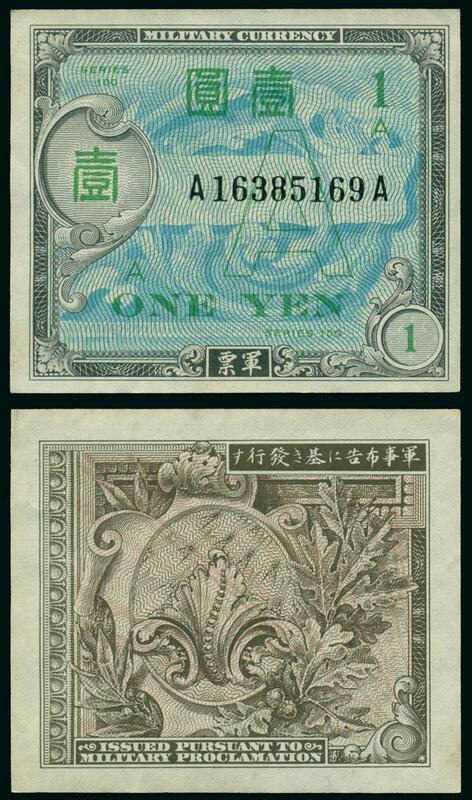 That charge is factored into the pricing of PMG graded notes on this webpage. 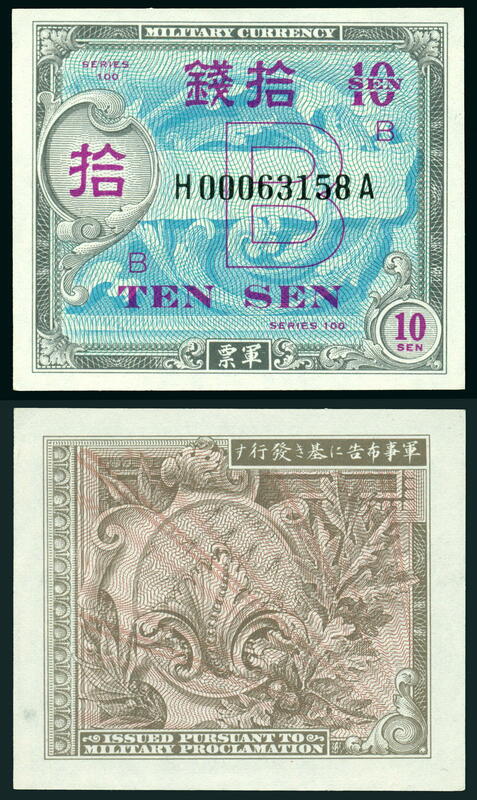 "B" yen notes were initially issued in 10s, 50s, 1y, 5y, 10y, 20y and 100y denominations. 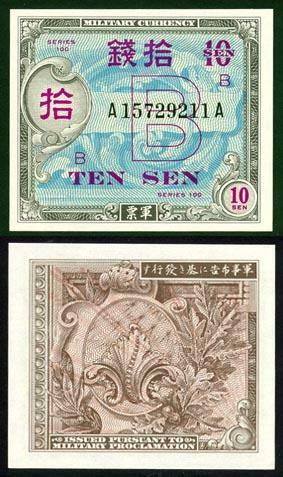 In 1951 the 1000y denomination was introduced. 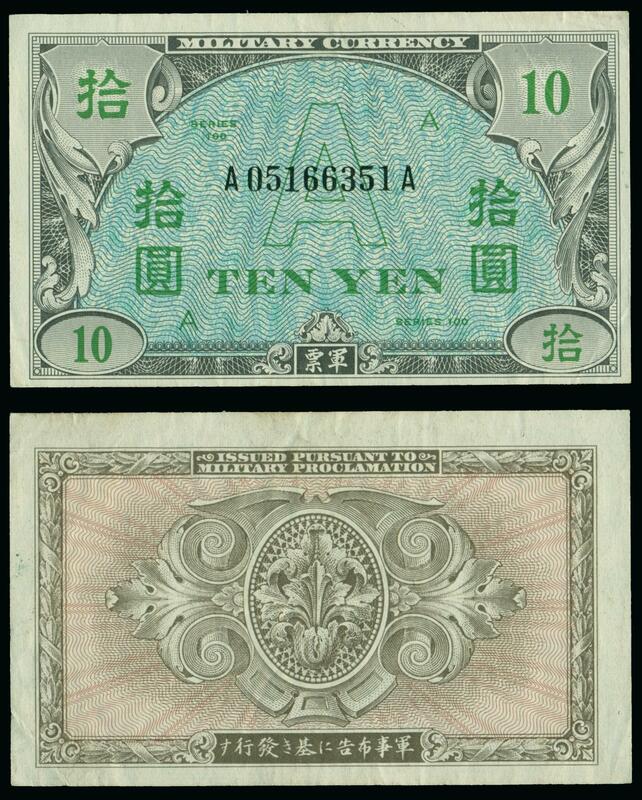 While most notes were printed by Strecher-Traung, some notes of 1, 5, and all the 1,000 yen were printed in Japan by the Ministry of Finance's Printing Bureau and the 1 yen block B-B notes were printed by the US Bureau of Engraving and Printing. 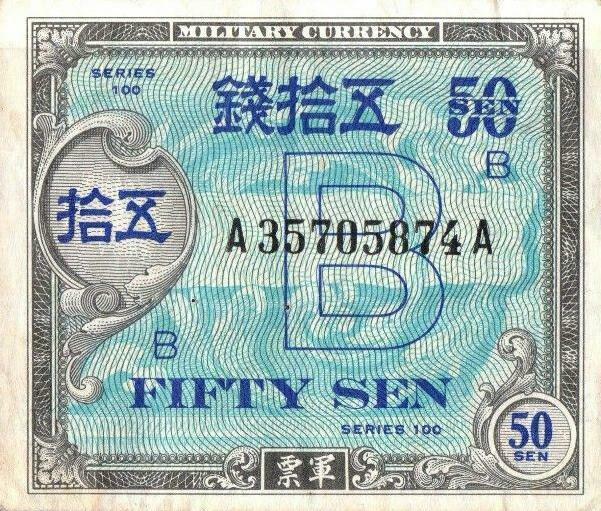 The "B" yen currency was in use in Okinawa until 1958 giving it the distinction of being the longest in use US military currency of the World War II era. 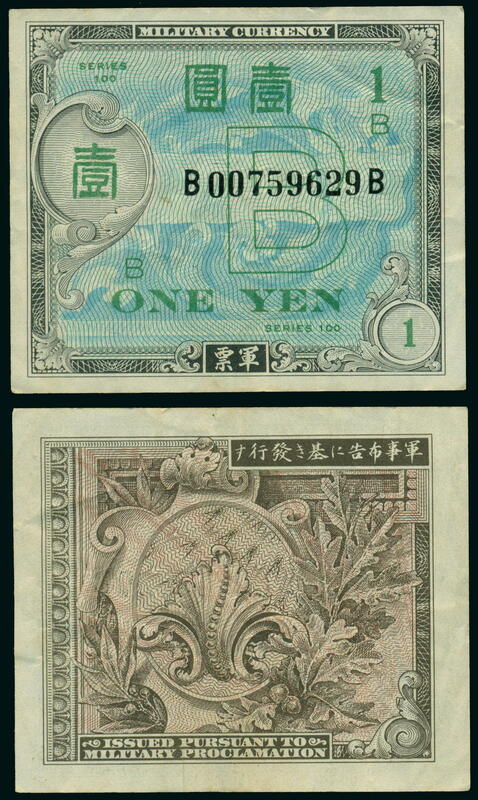 Both "B" and "A" underprinted military currency yen notes bear the series number 100. 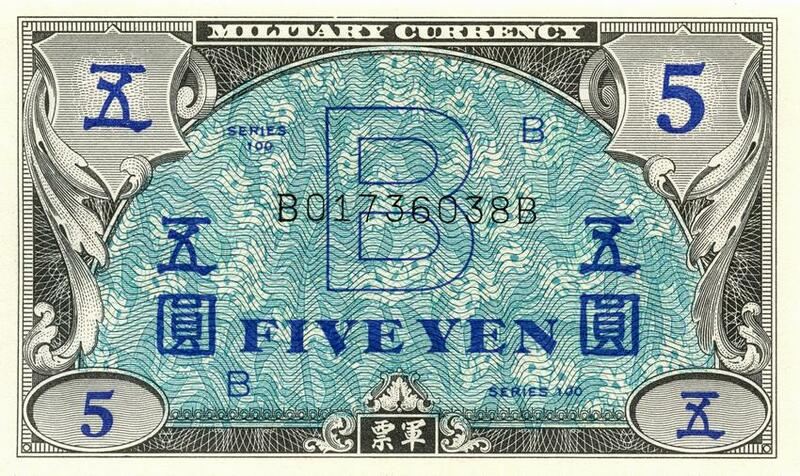 All "B" underprint notes have block letters associated with printers. 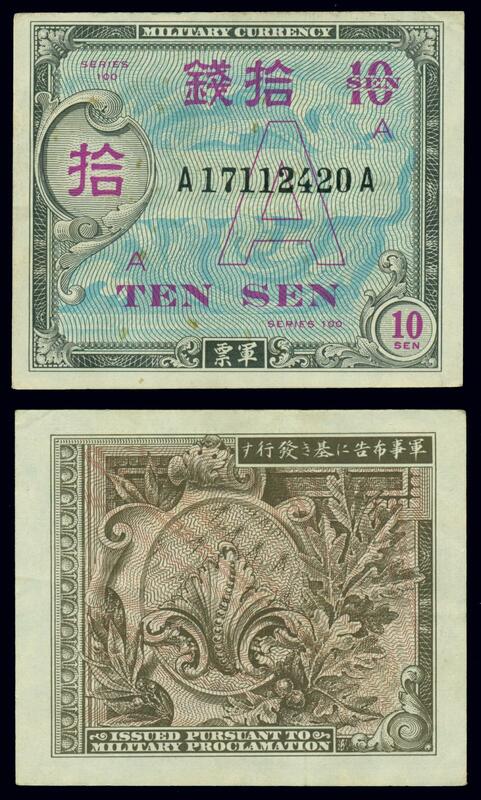 1 yen through 100 yen notes. 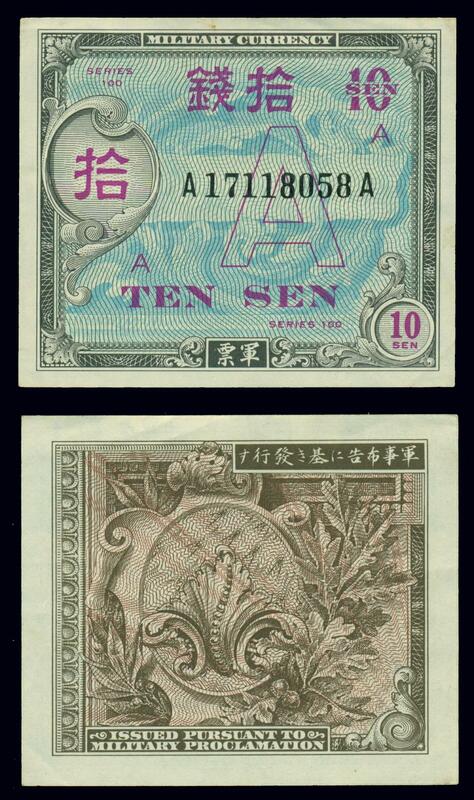 Block A-A, 10 sen, 50 sen, 1 yen, 5 yen, 10 yen, 20 yen and 100 yen, printed by Stecher-Traung, San Francisco in 1945 by offset lithography. 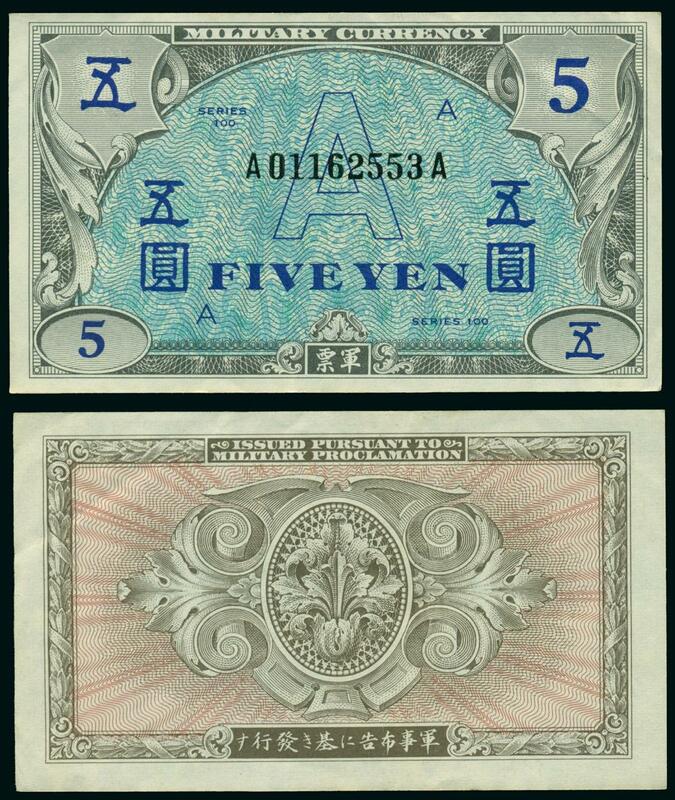 Notes were actually cut, numbered and wrapped by the California State Printing Office, Sacramento. 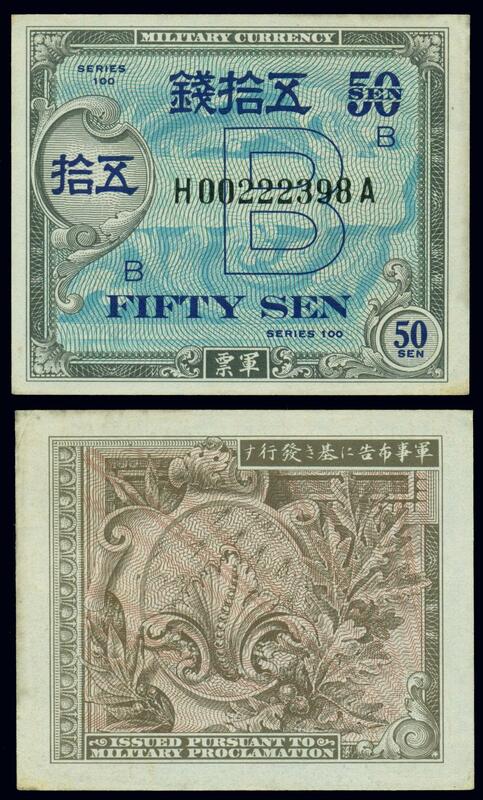 Block H-A replacement notes for defective block A-A notes. 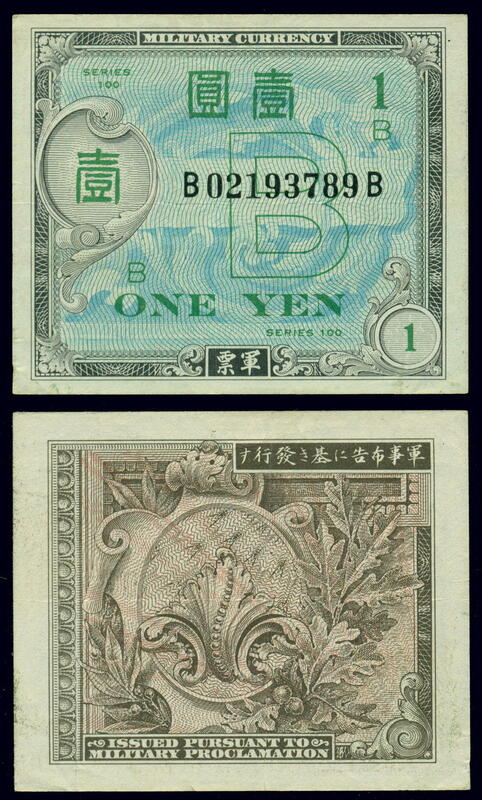 Block B-B, 1 yen, printed by the US Bureau of Engraving and Printing. 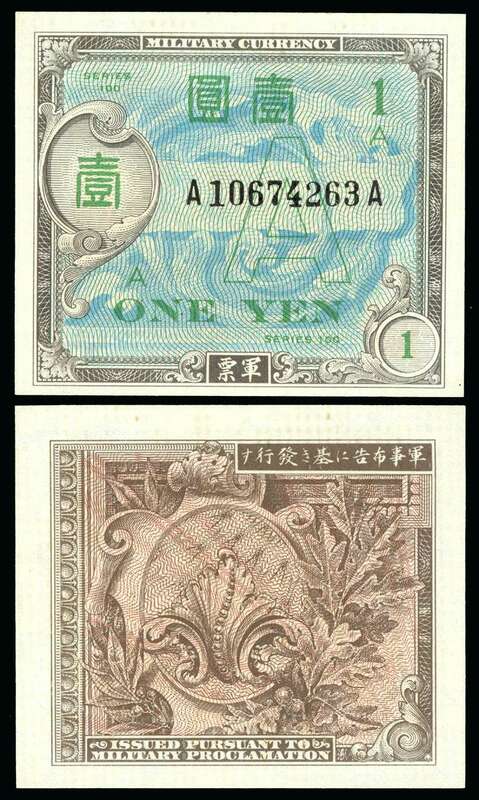 Block C-C, 1 yen, printed by Japan Ministry of Finance. 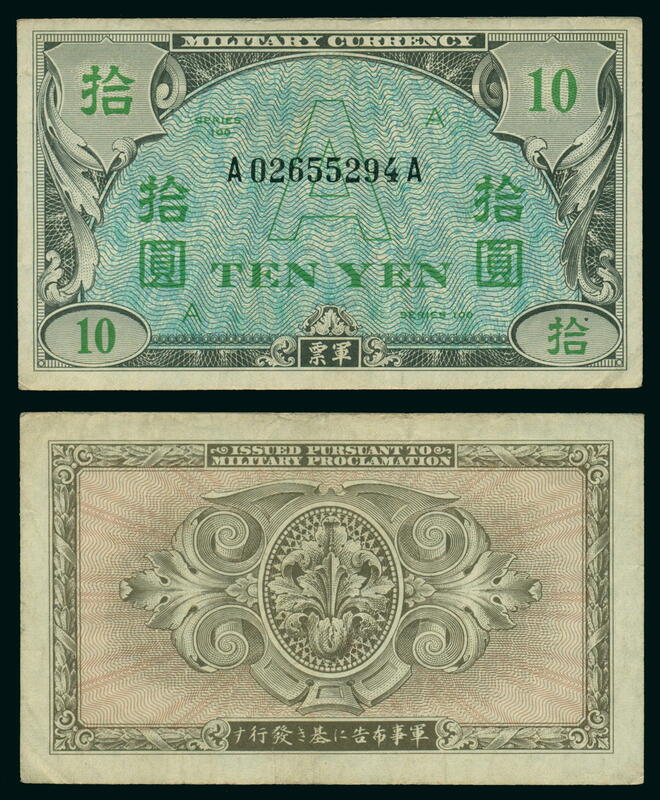 Block C-C, 1 yen replacement note - format currently undetermined. 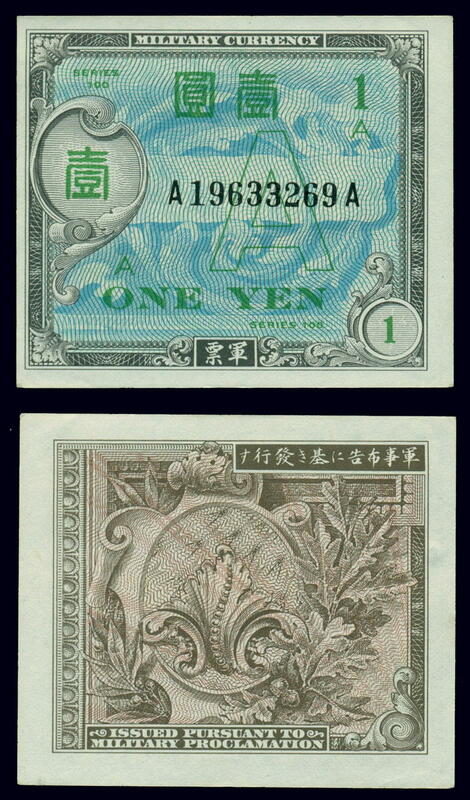 Block D-D, 1 yen, printed by Japan Ministry of Finance. 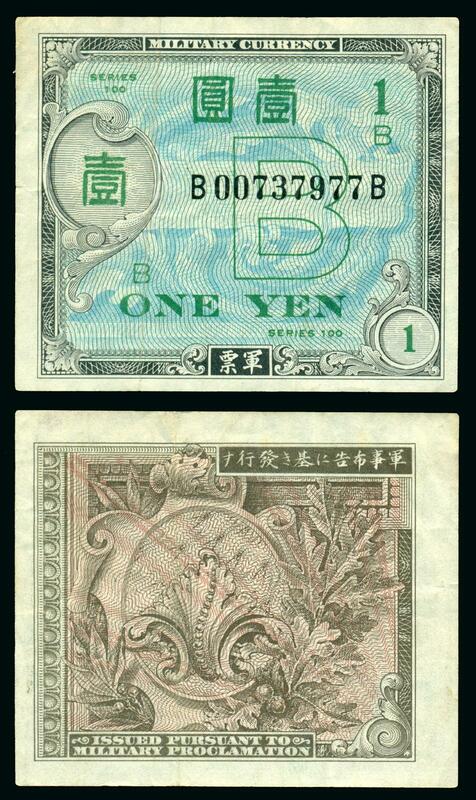 Block D-D, 1 yen replacement note - format currently undetermined. 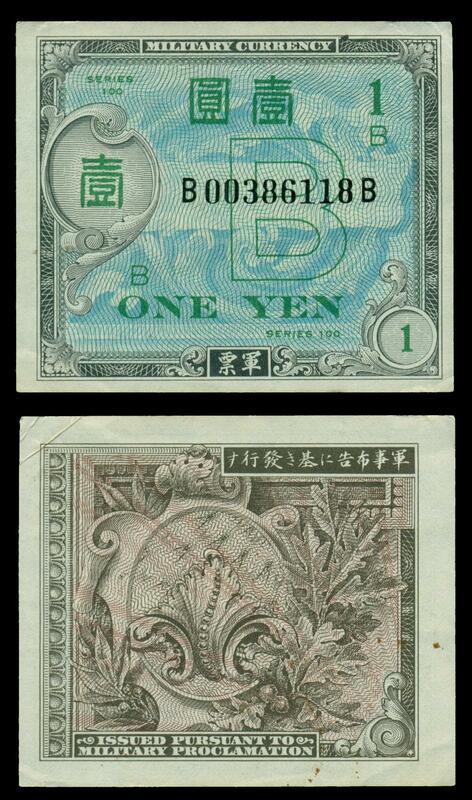 Block B-B, 5 yen replacement note - format currently undetermined. 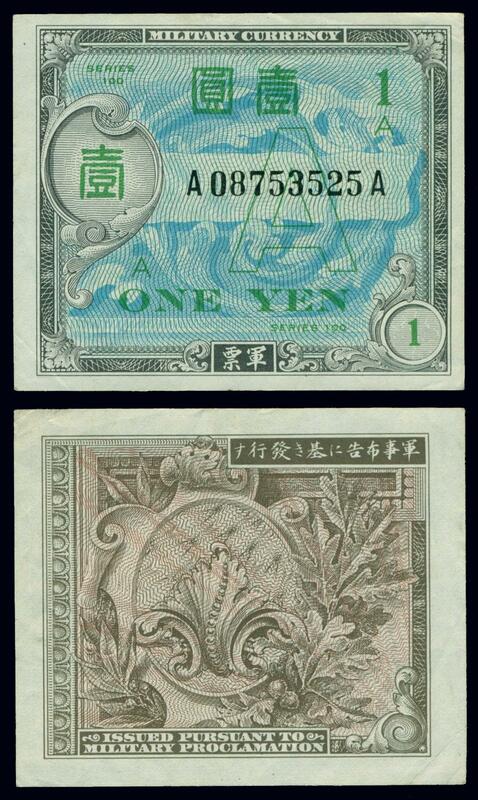 1,000 yen notes (5 printings). 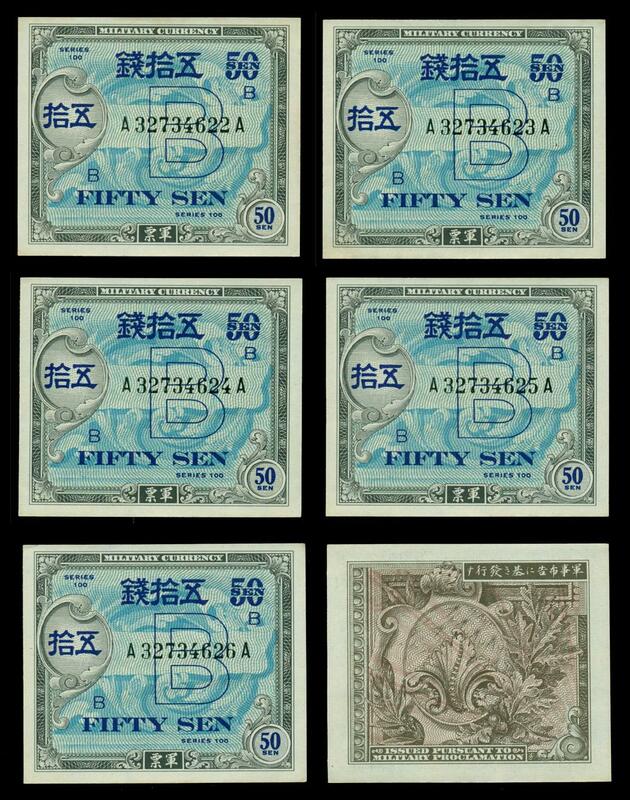 Blocks A-A, B-B, C-C, D-D and E-E, printed by Japan Ministry of Finance (1951-1955). 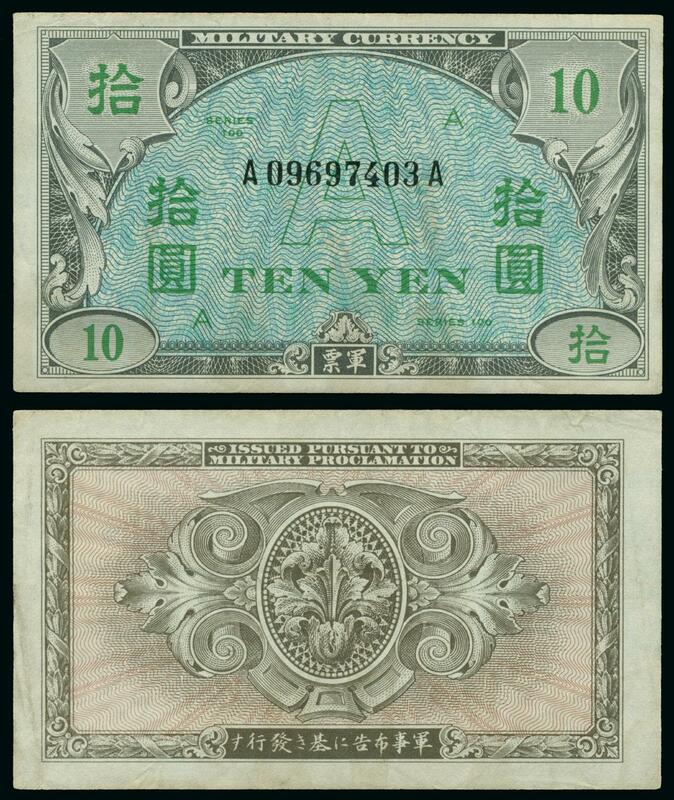 The replacement note format for all 1,000 yen notes is currently undetermined. 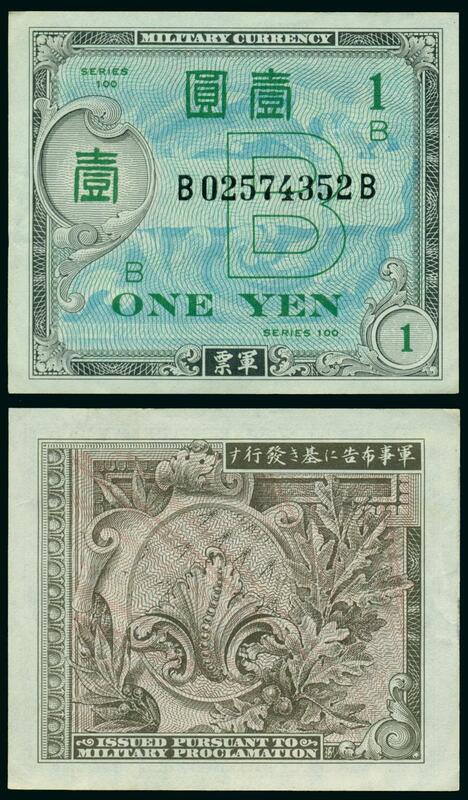 All of the 1000 yen notes were printed in Japan. 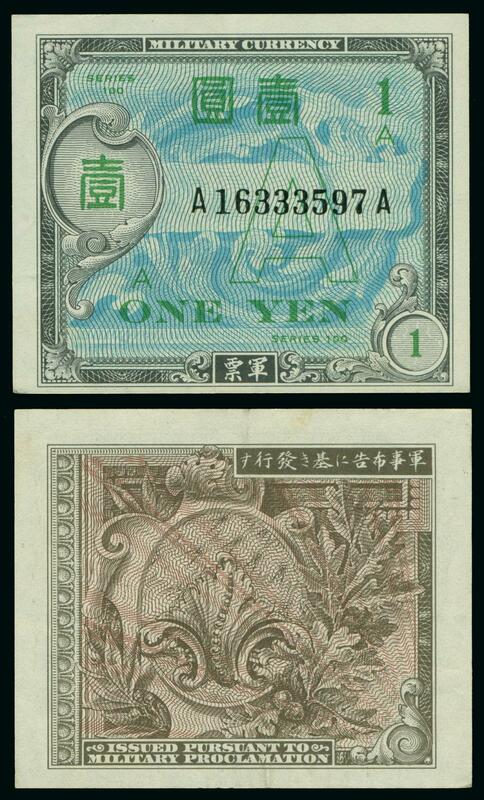 They were printed on light brown color paper, which is smooth on the front and slightly rough on the back, using the Intaglio printing process. 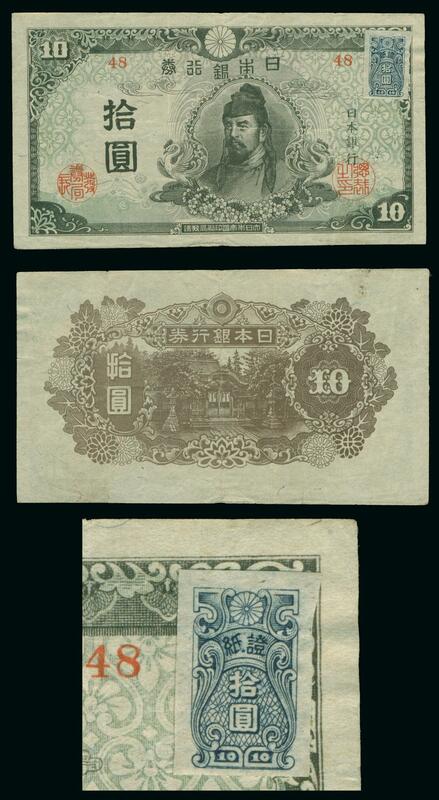 The other notes printed in Japan (1 yen C-C & D-D and 5 yen B-B) were printed on cream color paper. 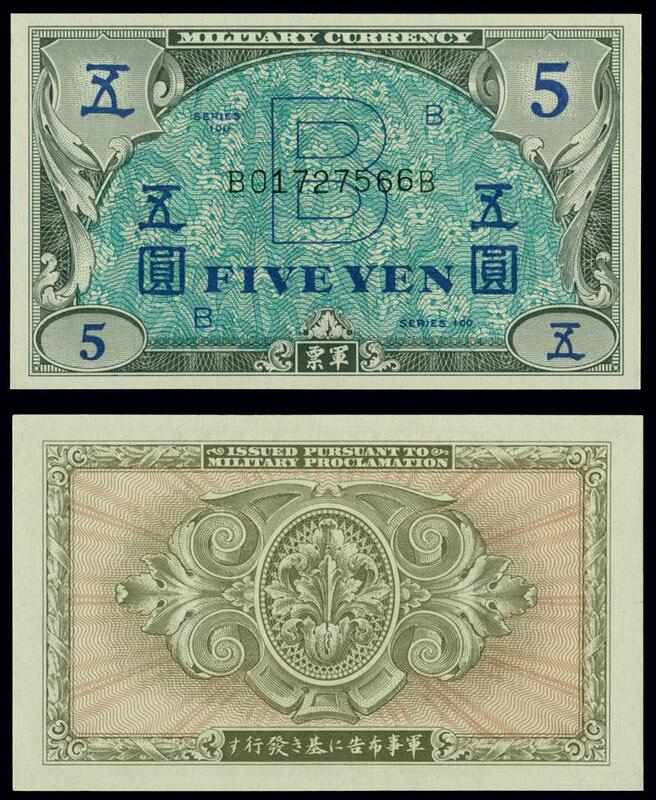 All denominations printed in the US were printed using offset color lithography (4 color) on watermarked (very faint) white bond paper. 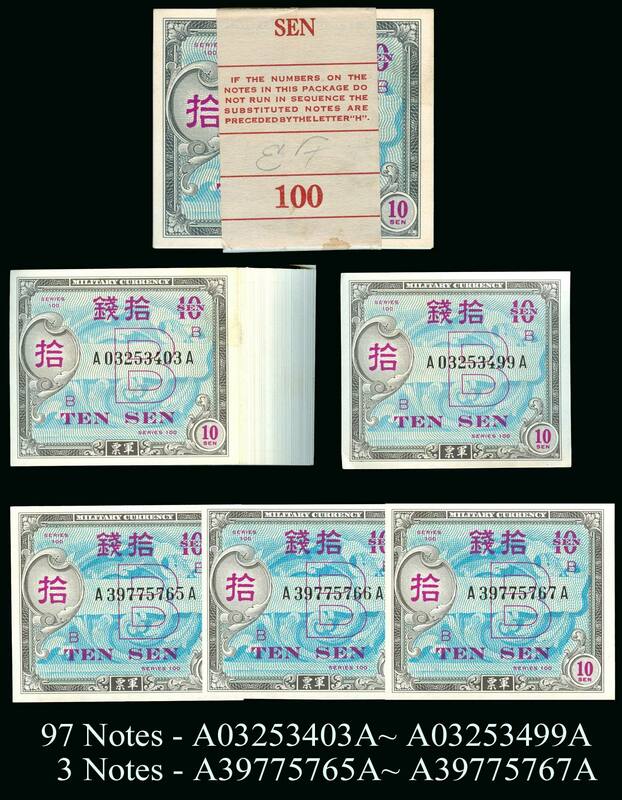 Notes in all denominations from 10 sen to 100 yen were prepared in 1945 and ready for use immediately on the invasion of Okinawa, April 1, 1945. 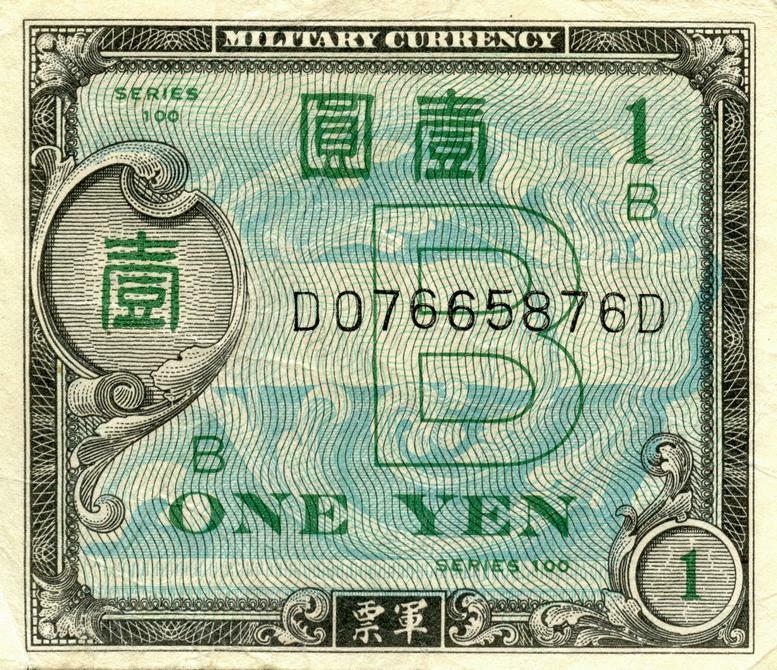 Troops on the invasion ships were allowed to draw small amounts of the "B" yen and actually carried it ashore when they landed. 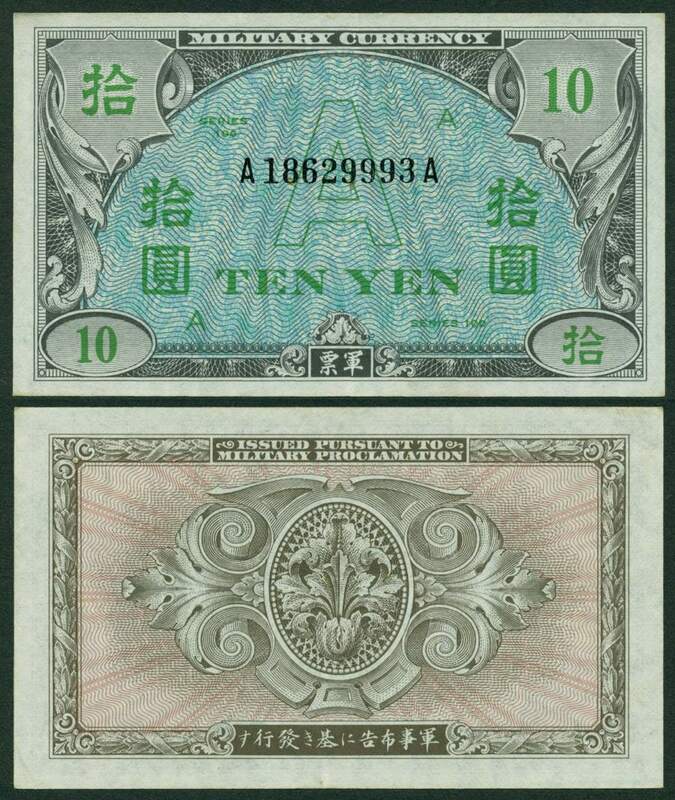 The value of the 100 yen note was approximately 80c so it easy to understand that the need for a larger denomination note soon developed. 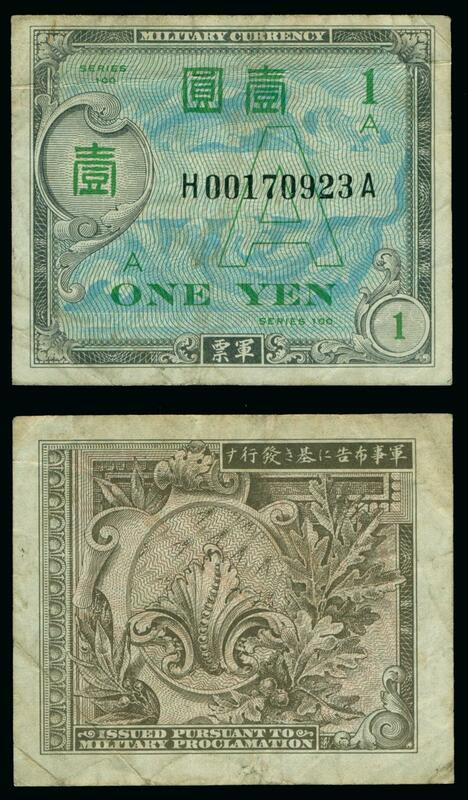 The 1,000 yen notes were first issued in December of 1951. 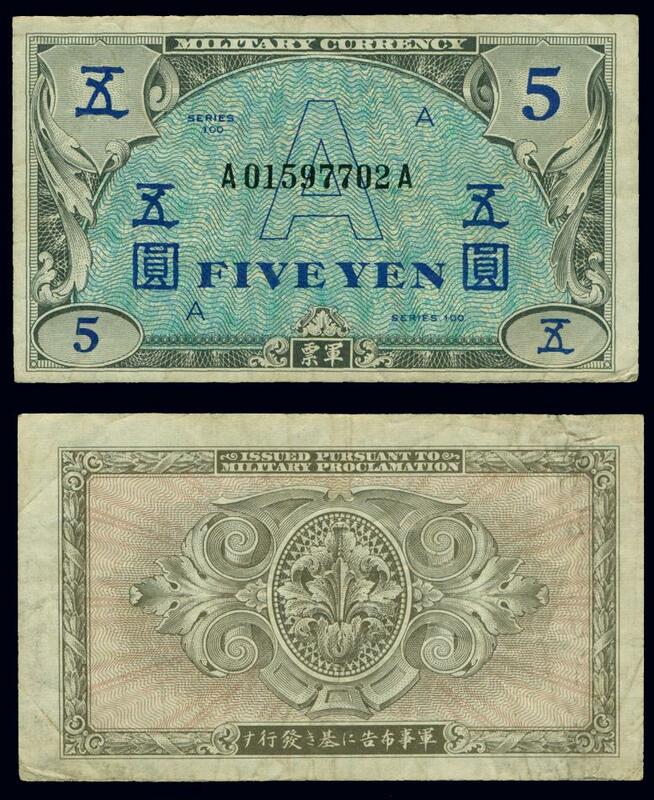 Replacement notes (block H-A) substituted into packs of notes did not have the same numbers as the block "A-A" notes they replaced. 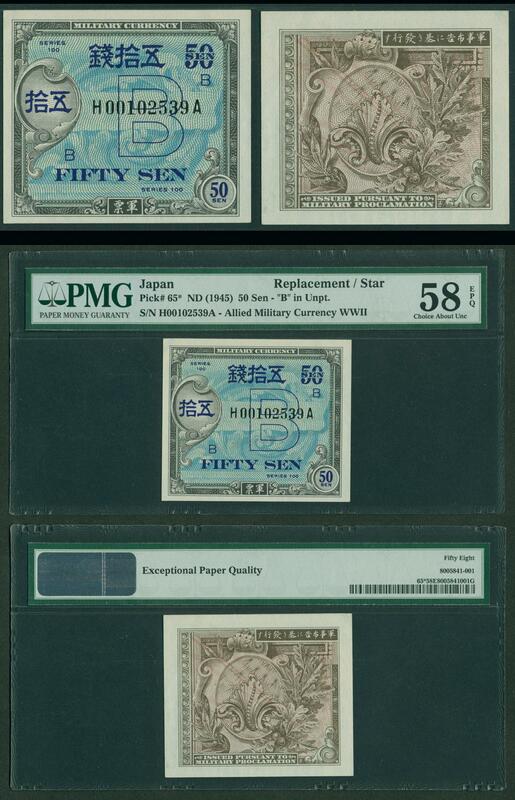 The replacement notes were added into packs in the there own numerical sequence. 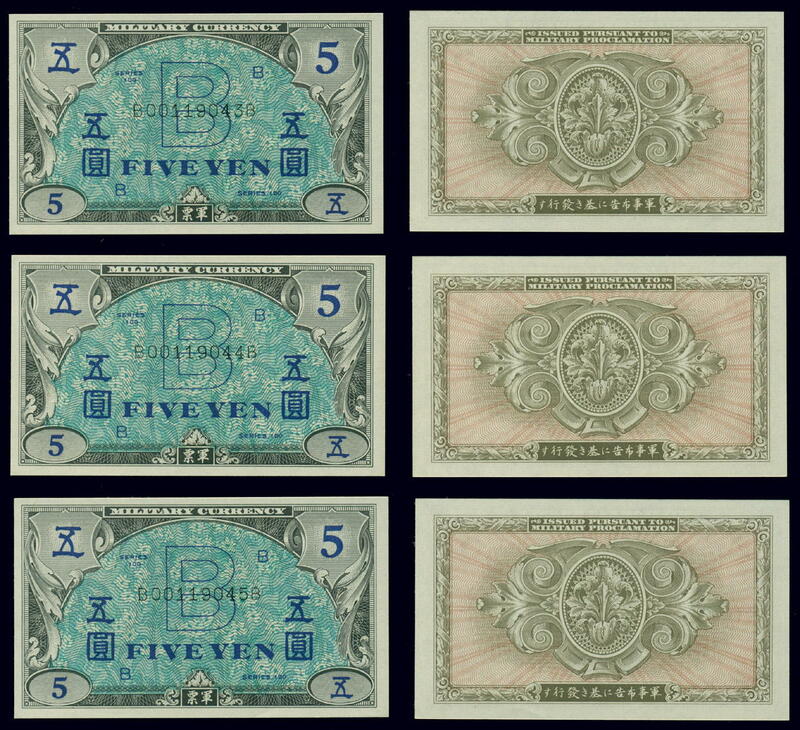 The numbers above in brackets [ ] represent my recorded high serial number for each note. 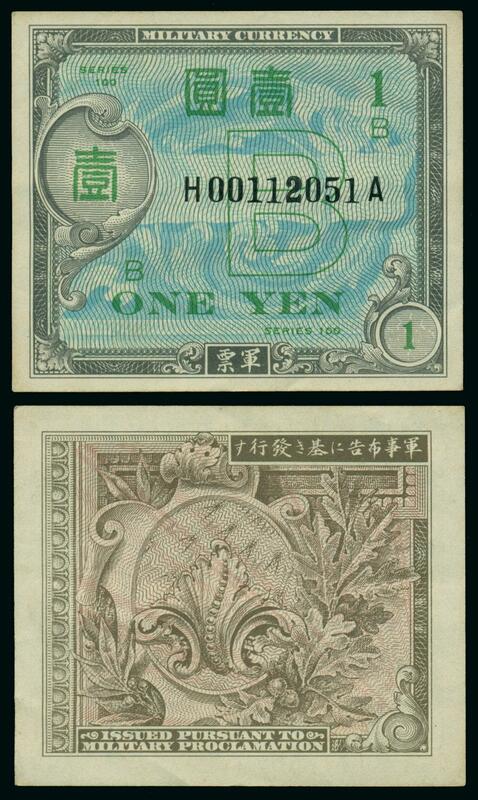 number and rounded up or down to show the closest 100,000s (or 1,000 for the 1,000 yen notes). 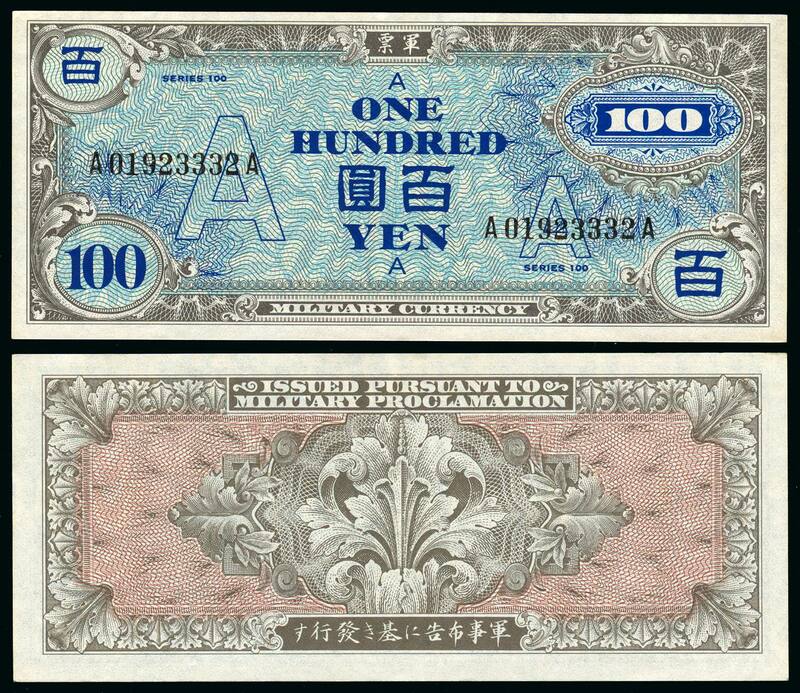 * 1000y D-D. 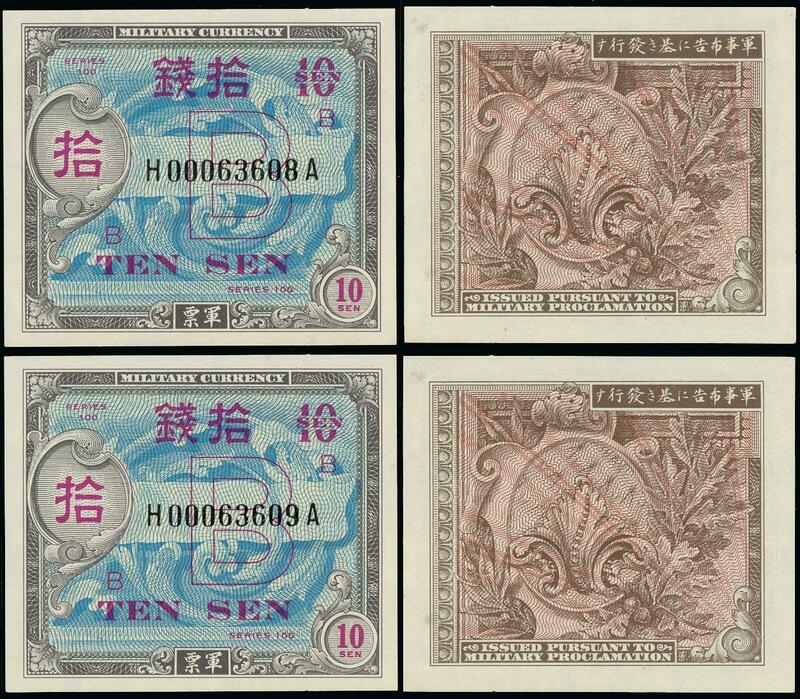 There are only 6 digits and no "0" place holder for the seventh digit. 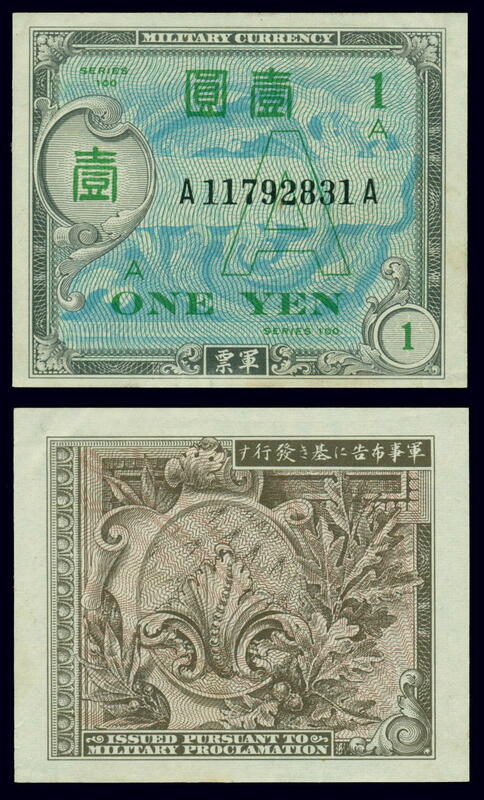 The "A" yen notes were issued in 10s, 50s, 1y, 5y, 10y, 20y and 100y denominations. 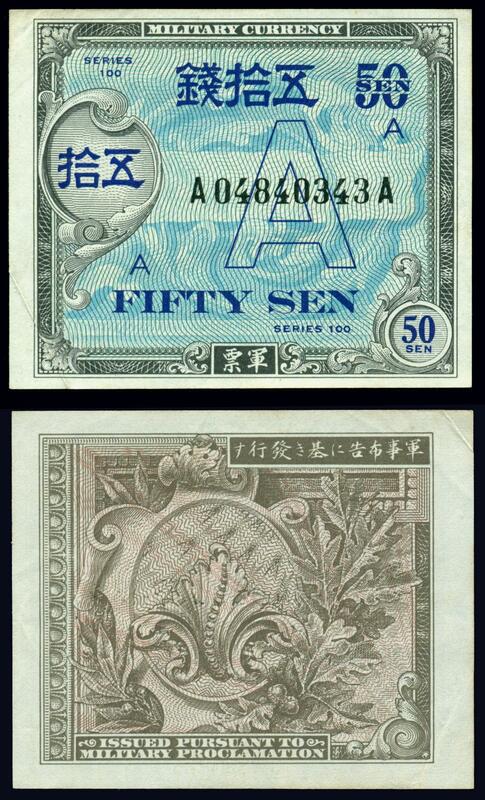 All "A" underprinted notes are block A-A except for replacements which are block H-A. 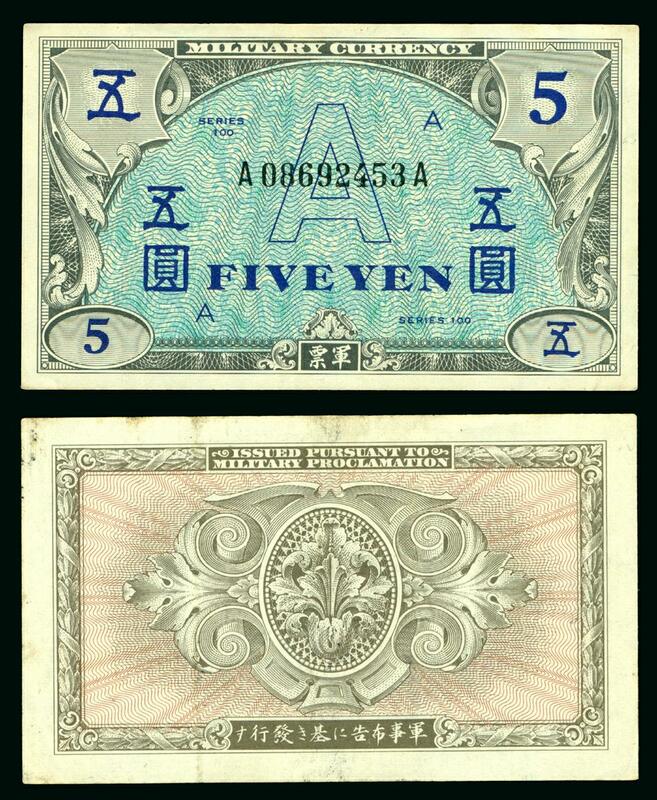 Specimen replacement notes (block H-A with "Specimen" perforation at the bottom center) exist for all 7 notes in this series. 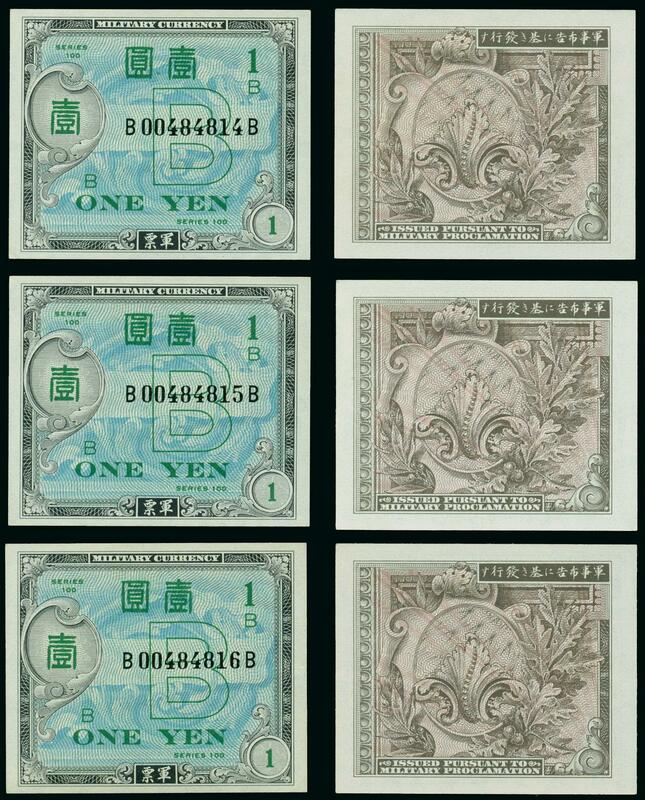 While there were 20,000,000 more "A" series notes delivered than "B" series (1945) notes (331+ million vrs 311+ million), the "A" series notes are scarcer than the "B" series. 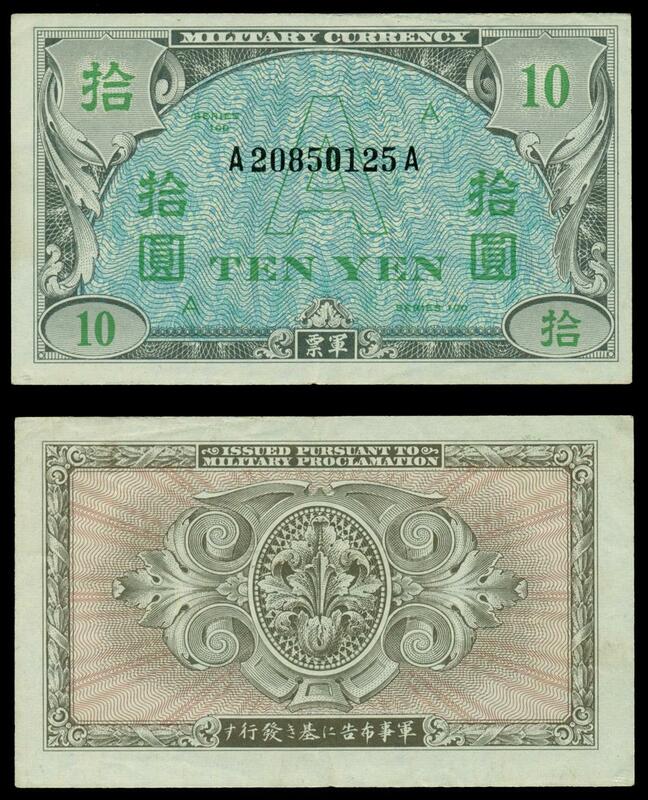 The high value 20 yen and 100 yen "A" series notes were delivered in substantially smaller quantities than the same "B" series denominations. 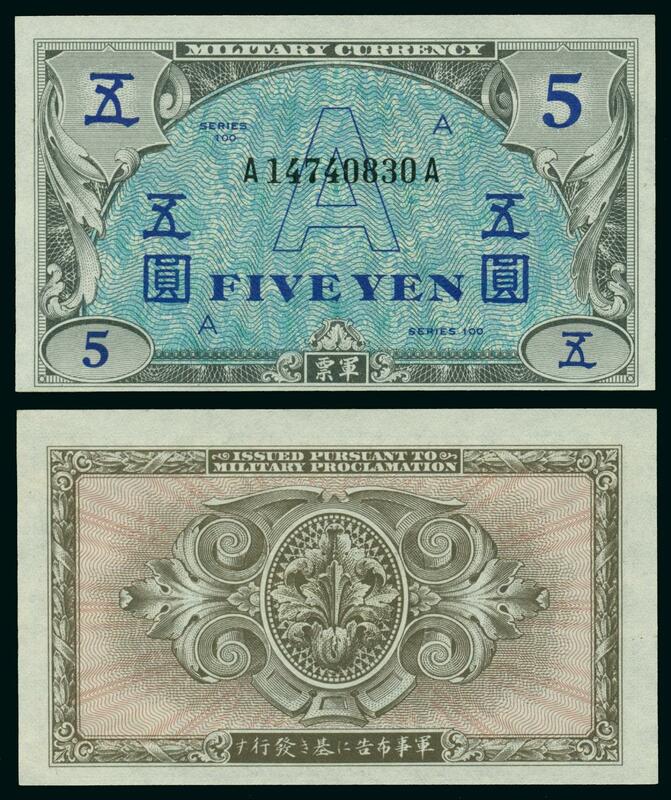 The "A" underprinted notes were in use in Japan and the Ryukyu Islands for a little over two months (July 19, 1946 to September 30, 1946) but only as a form of military payment certificate and not by the civilian population. 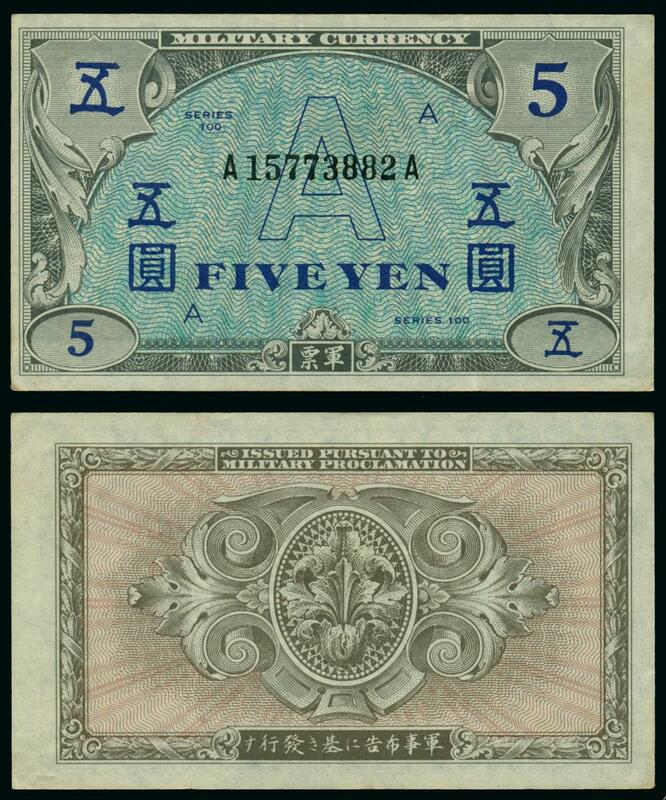 They were used in Korea from September 7, 1945 through July 10, 1946 as general currency (apparently more of an official recognized status than actual use) and from July 19 to September 30, 1946 as a form of military payment certificate. 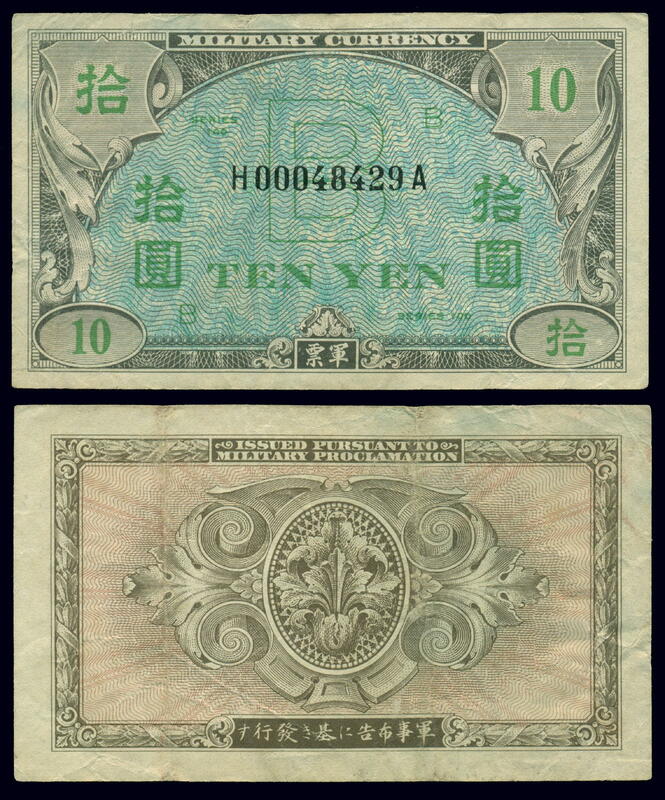 The "B" yen underprinted notes were used in Japan by the civilian population from September 6, 1945 through July 15, 1948. 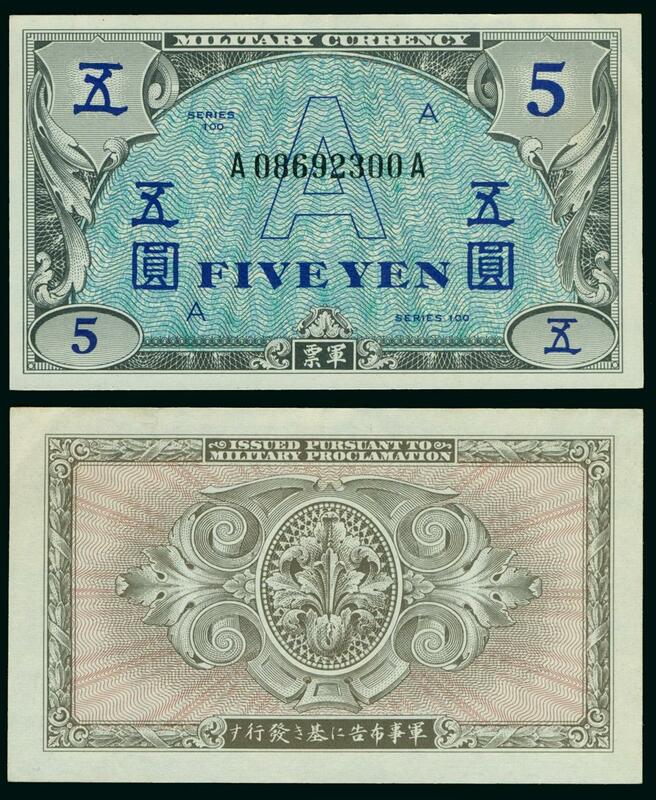 US Forces personnel were issued "B" yen currency prior to the invasion of Okinawa on April 1, 1945. 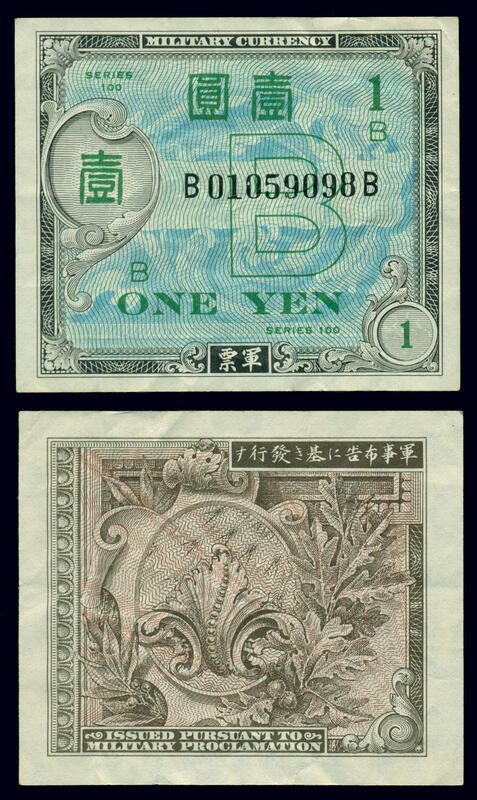 The "B" notes yen were used almost continually in the Ryukyu Islands from April 1, 1945 until September 30, 1958. 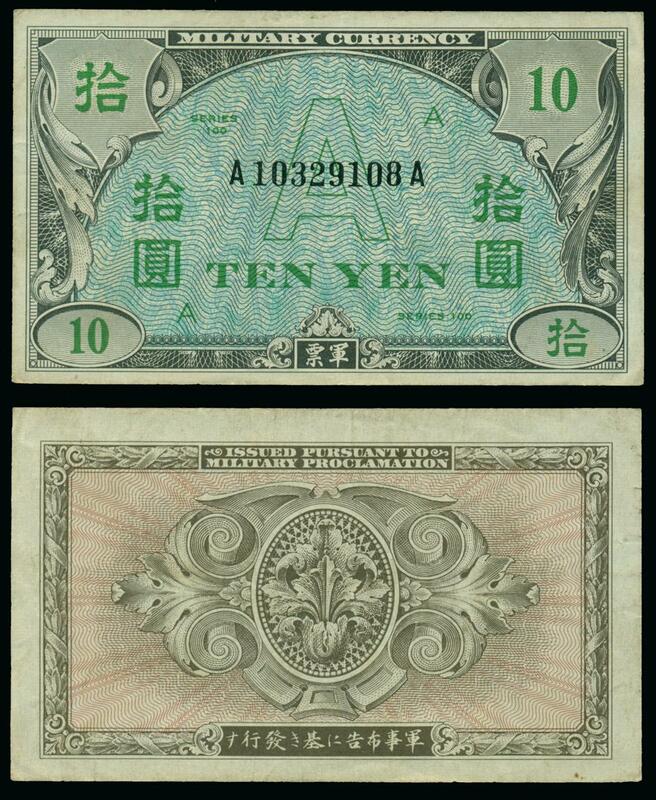 There was a short period in 1946 (July 19, 1946 to September 30, 1946) when the "B" yen notes held by US Forces personnel were replaced with "A" yen notes. 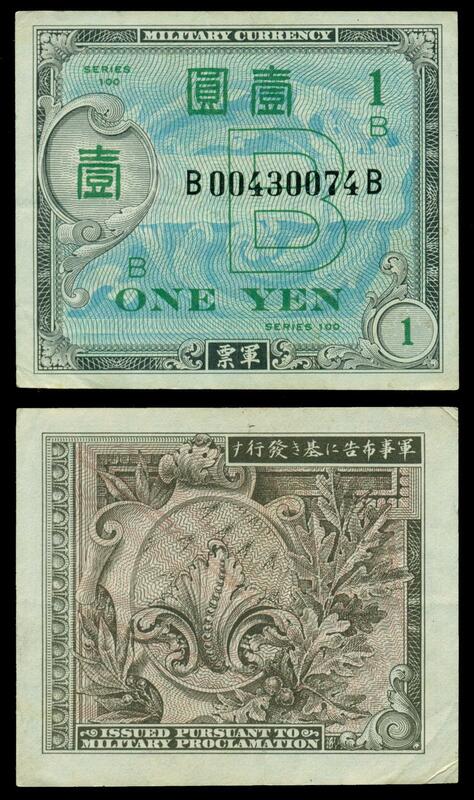 This period was brief (2+ months) and then the "A" yen notes were withdrawn and "B" yen reissued. 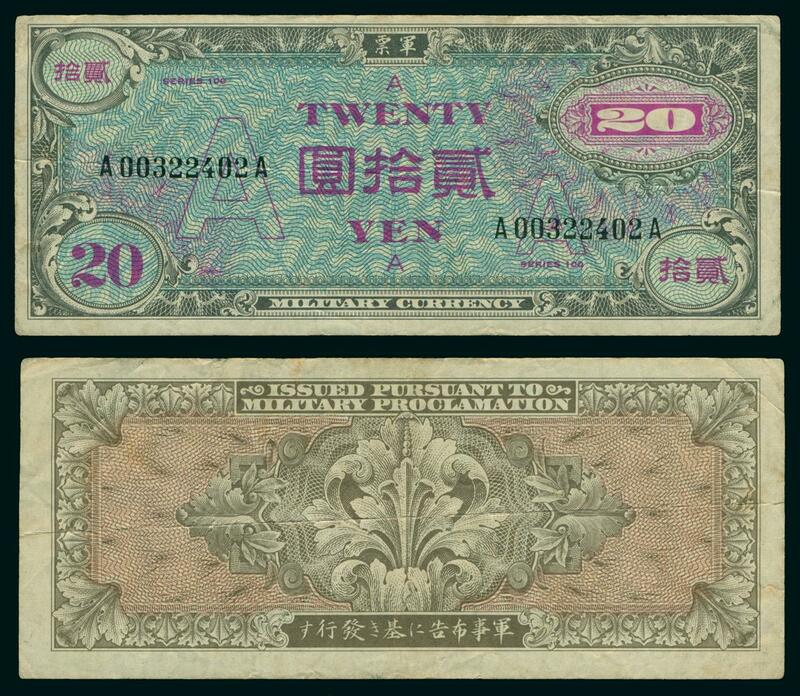 While the immediate post war period was probably more of a barter economy for the civilian population, a basic currency system was being established by US military authorities in the Ryukyu Islands. From the invasion on April 1, 1945 until April 14, 1946 existing Japanese notes and coins and the US issued "B" yen notes were used by the civilian population. 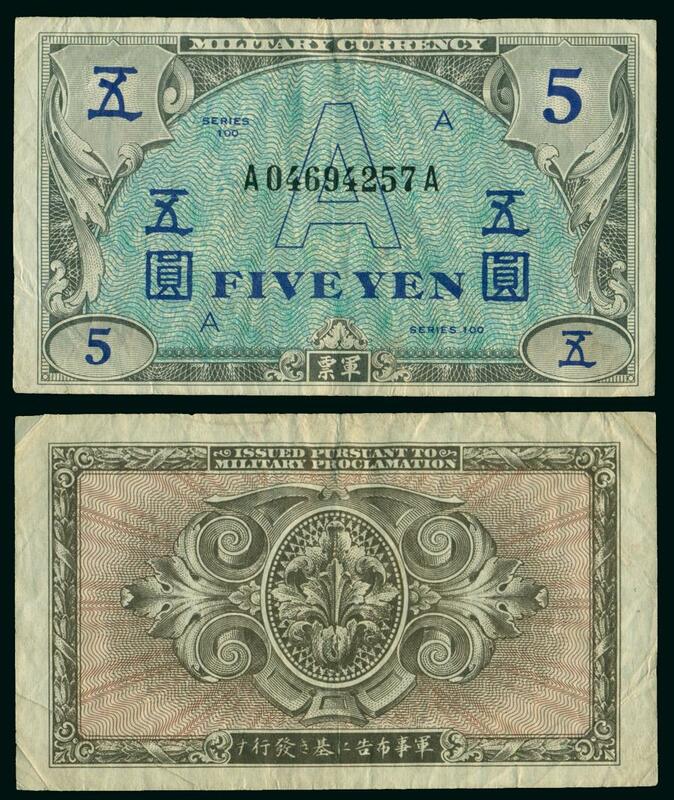 Effective April 15, 1946 legal tender for the civilian population included (in addition to the "B" yen) "New" Bank of Japan notes and old Japanese notes and coins under 5 yen and old Japanese notes over 5 yen if they were revalidated by affixing a special stamp (shoshi). 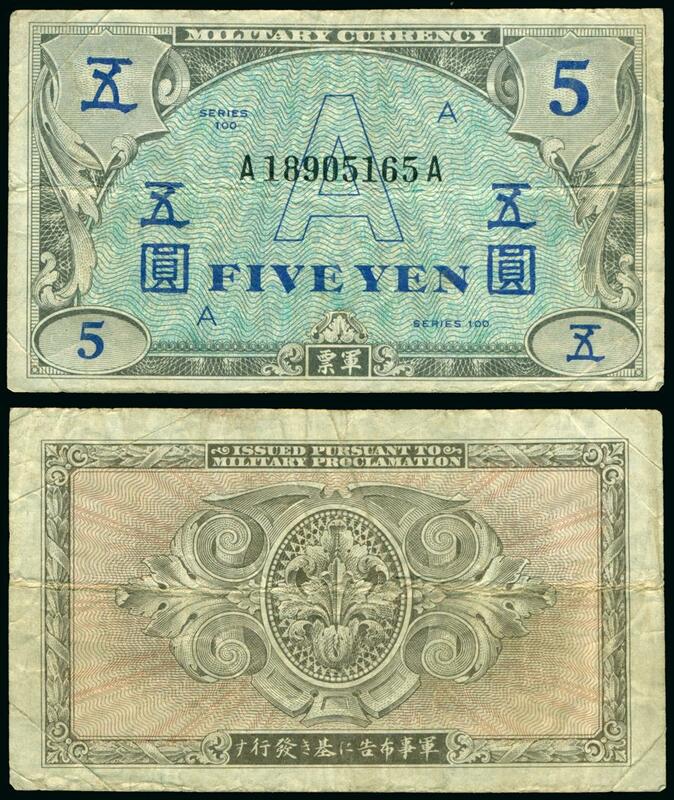 This system lasted until September 1, 1946 when all Japanese notes were required to be the "New" Bank of Japan issue and "B" yen was no longer legal tender for the civilian population. 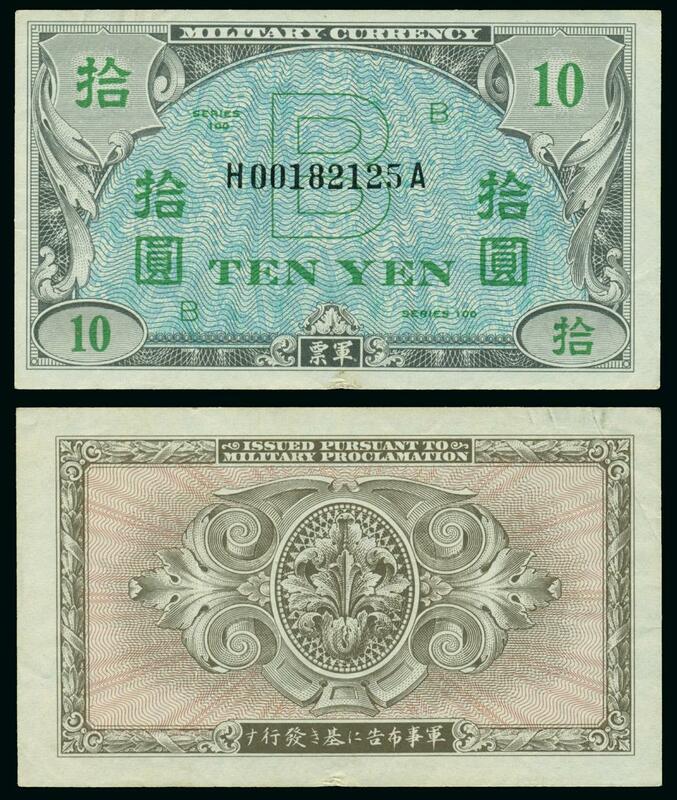 On August 1, 1947, the civilian population was again authorized to use the "B" yen notes as legal tender along with the "New" Bank of Japan notes. 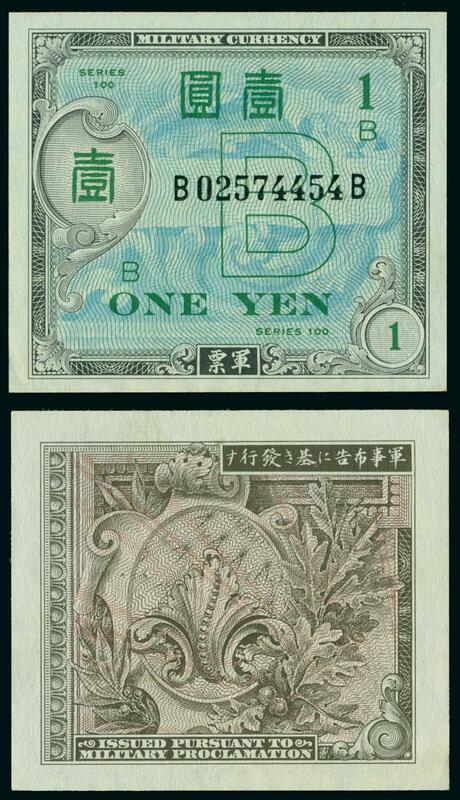 Finally, on July 21, 1948, the only legal tender for the civilian population became the "B" yen. 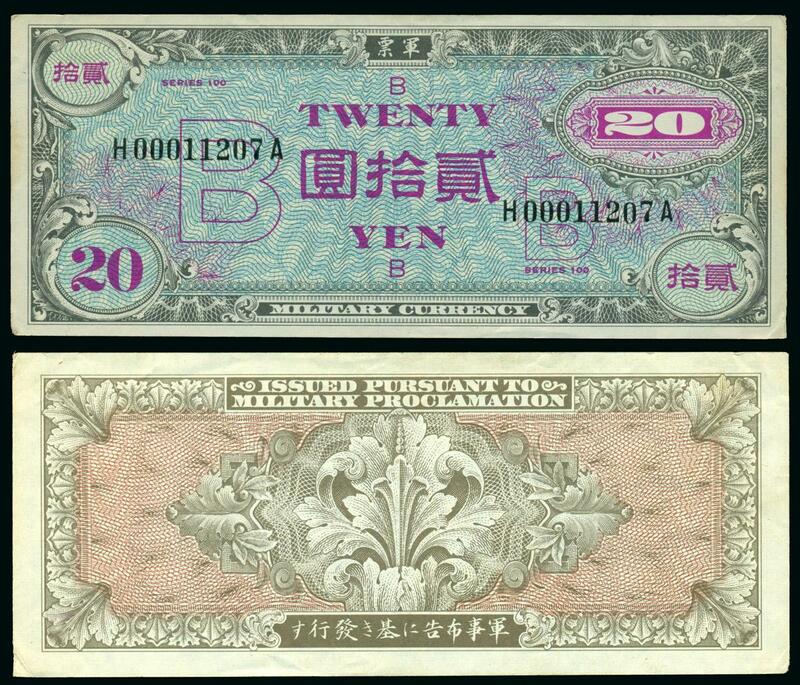 No doubt these constant and drastic changes in legal tender caused much confusion. 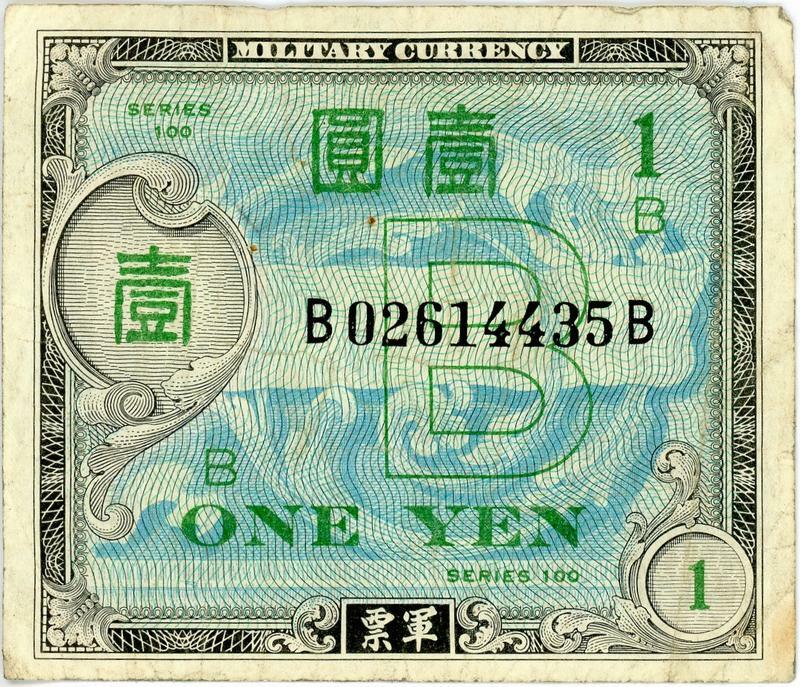 In addition, while not authorized for use by the civilian population, Military Payment Certificates and even "A" yen was circulating in the US forces community. 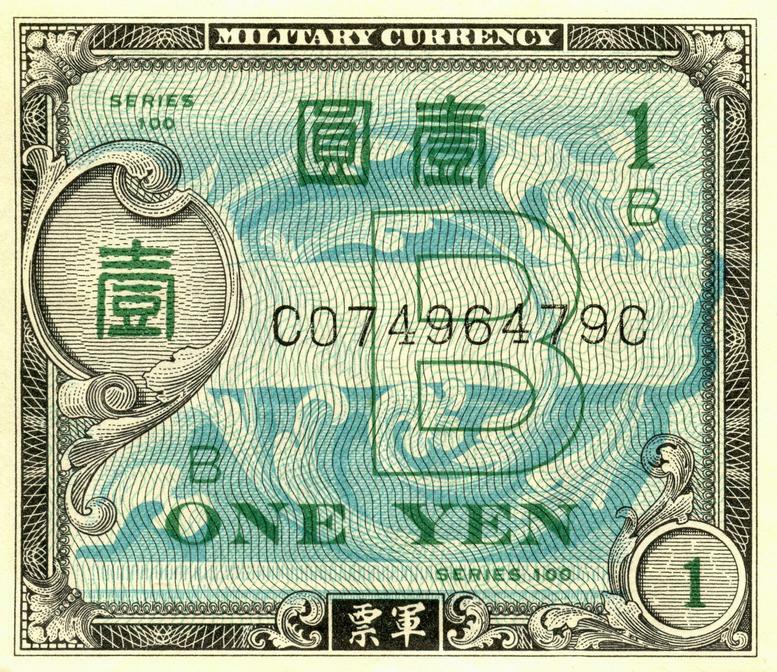 I suspect that those notes leaked outside of the US forces system, particularly in the off base businesses servicemen tended to frequent. 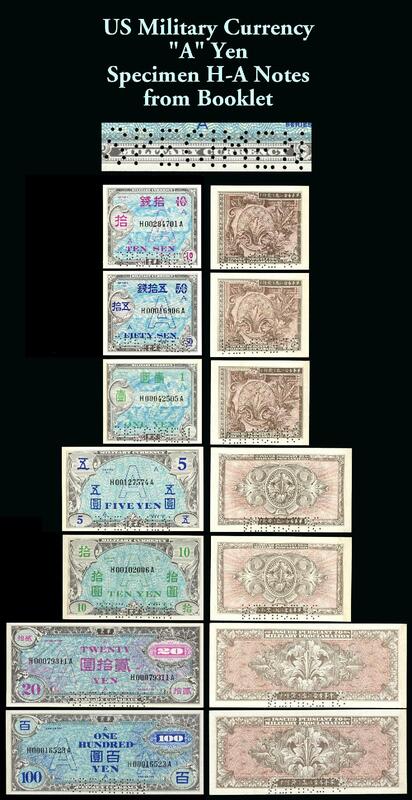 Minoru Sera, in his Ryukyus Handbook,* published a chart (page 195) outlining these various currency stages in the Ryukyu Islands as it related to the civilian population. The discussion in the preceding paragraph is based upon the information in that chart. 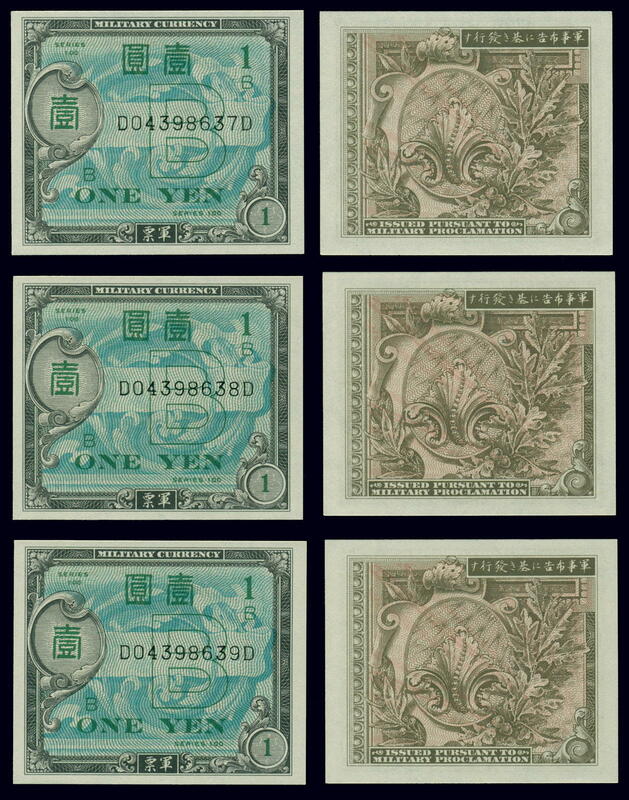 * (Sera, Minoru, Ryukyus Handbook, Philatelic and Historic, Tokyo, printed by the Radiopress Tokyo, 1962, 8vo, gray cloth, 238 pp). 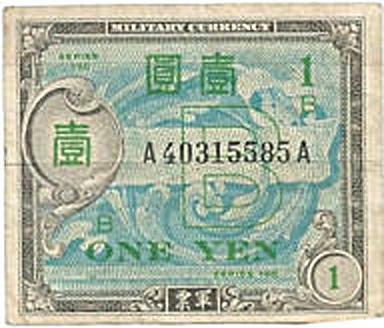 The civilian (non-US Forces) monetary system existing in the Ryukyu Islands immediately after WWII is discussed in a 2003 "Working Paper"** published by the Department of Economics, Vanderbilt University. 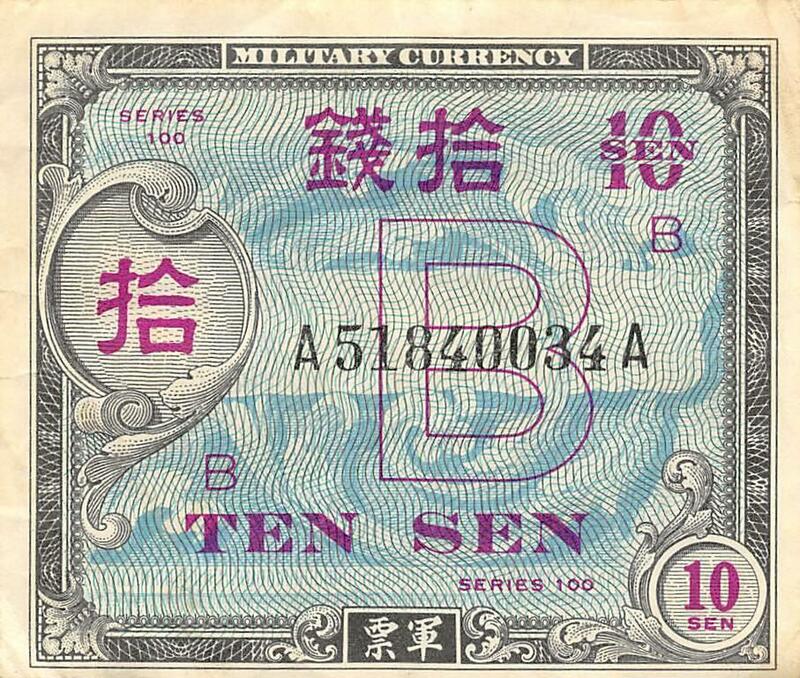 The discussion of the monetary system for the civilian population tracks the discussion by M. Sera but is confusing as it relates to the prohibition of the use of "B" yen by the civilian population during the period from September 1, 1946 to August 1, 1947. 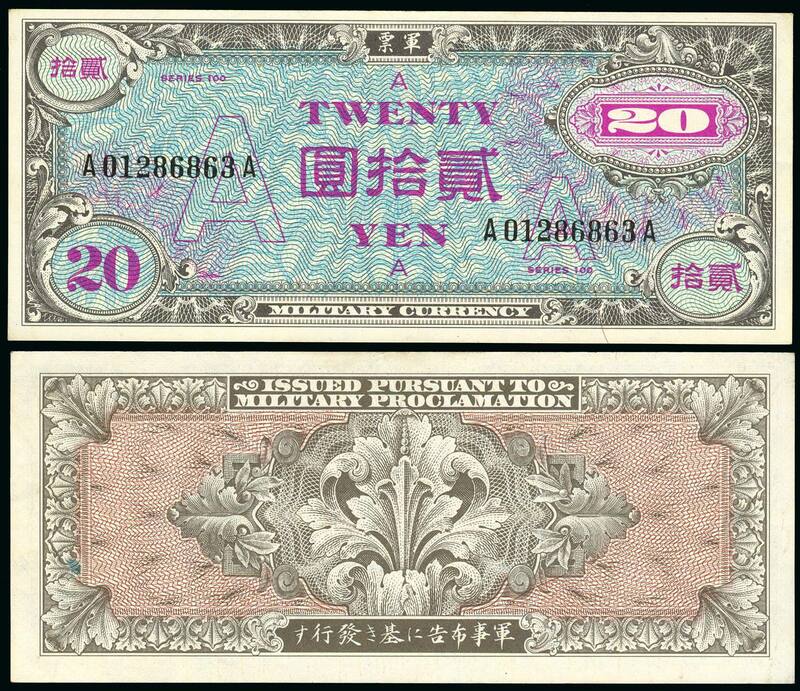 Also, the author's did not mention the use of the revalidated old Japanese notes. 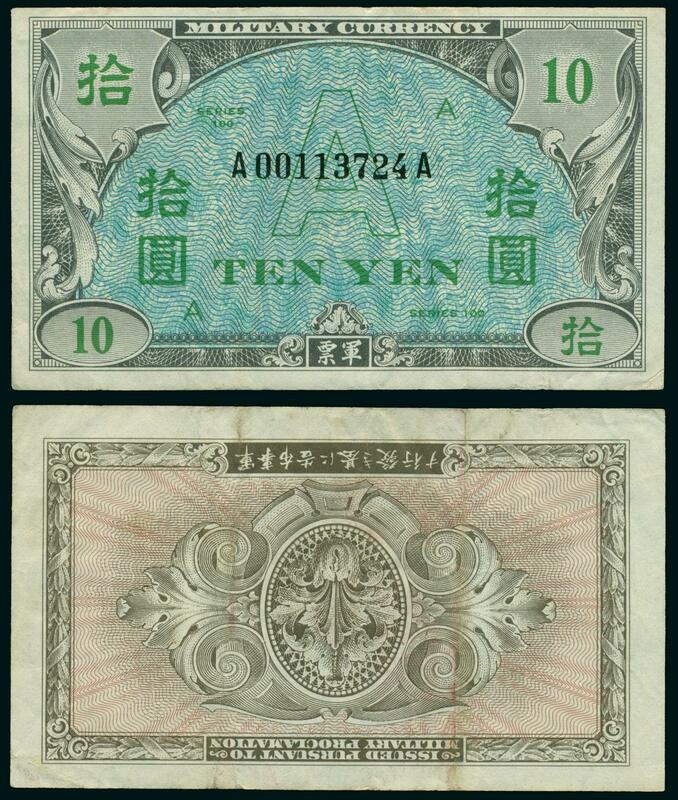 The working paper notes that on July 15, 1948, the Japanese Ministry of Finance issued a directive "...terminating the status of B-yen notes as legal tender in Japan." 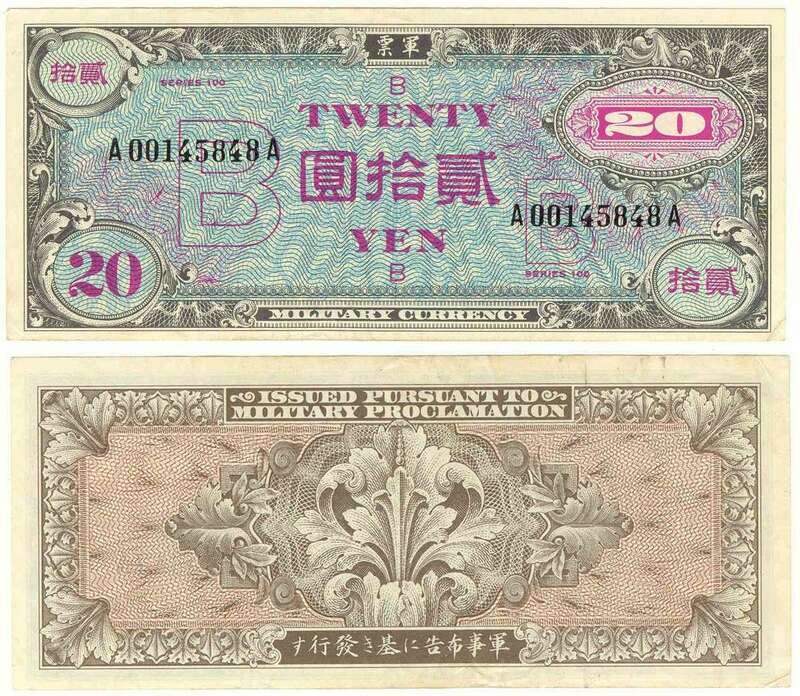 ** (Shinji Takagi, Motosugu Shintani and Tetsuro Okamoto, Measuring the Economic Impact of Monetary Union: The Case on Okinawa, Working Paper No. 03-W15, Department of Economics, Vanderbilt University, July, 2003, Nashville TN, 28 pp. 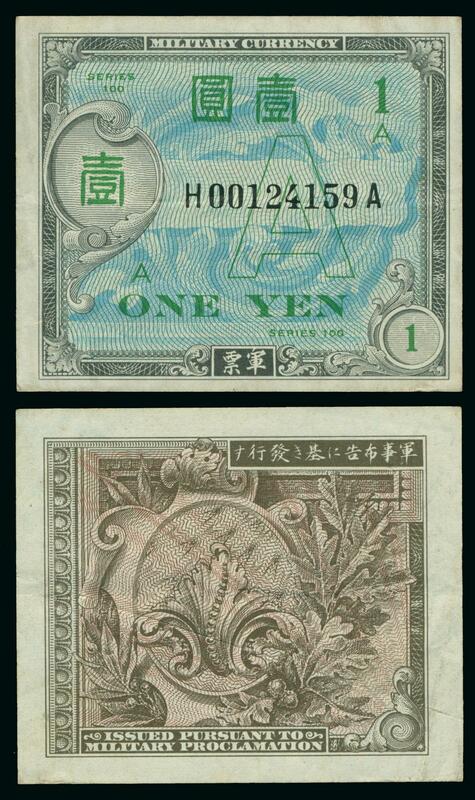 On-line here. 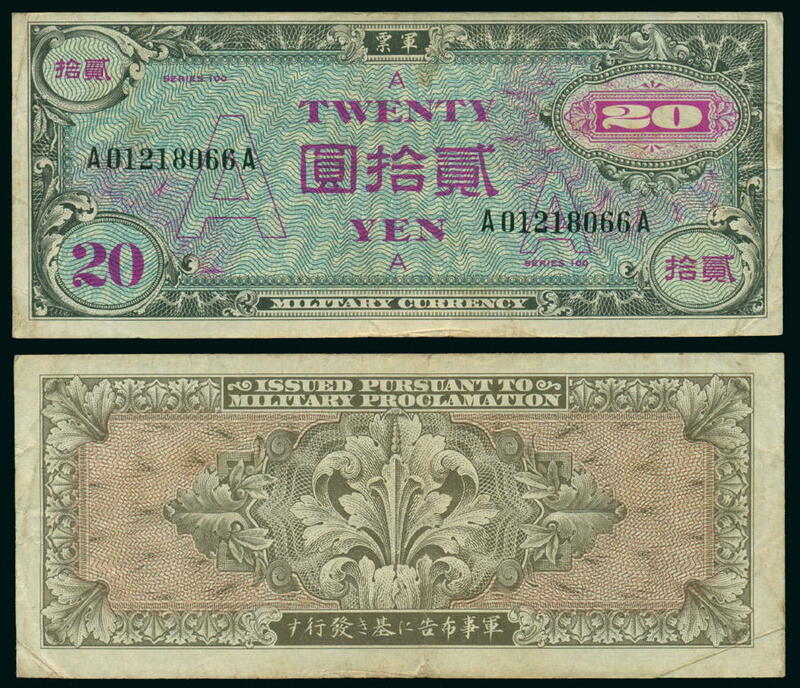 The monetary system established immediately after the war is found in Paragraph II starting at page 3). 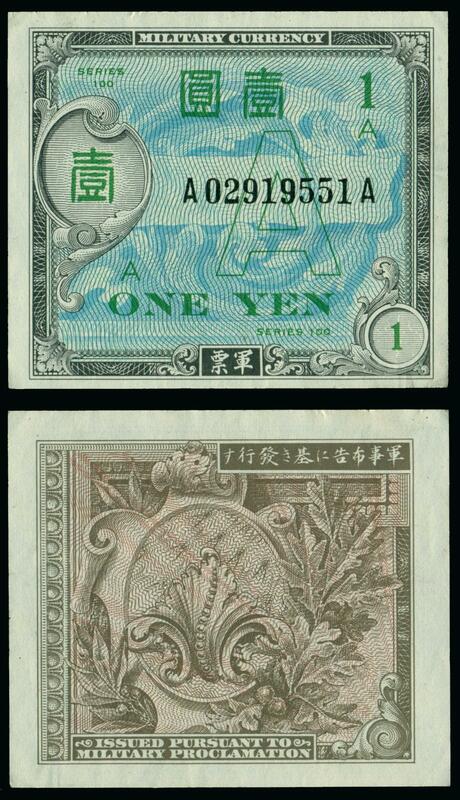 Death and Burial of a Currency. 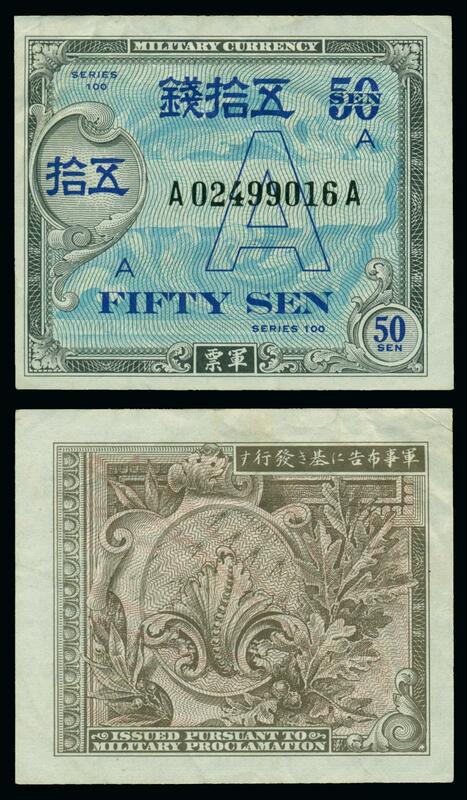 When the B Yen currency was demonetized it was reported that the remains were disposed of in an unusual manner. 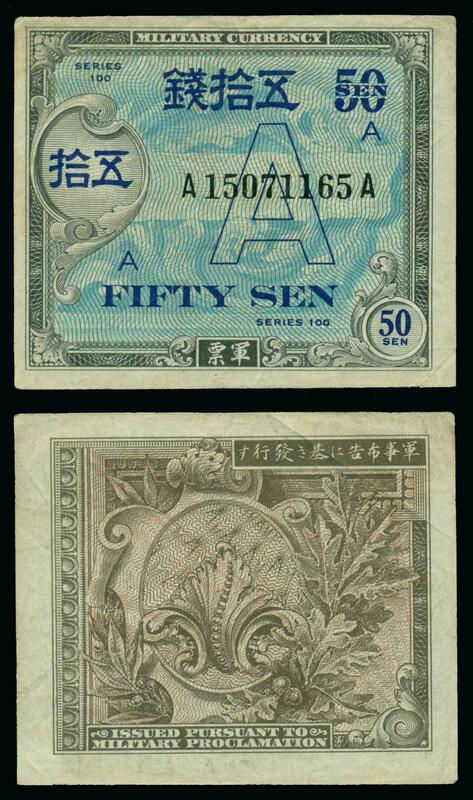 Rather than the traditional cremation (incineration) old paper currency usually faces, it is reported to have been provided a Mafia type burial at sea. 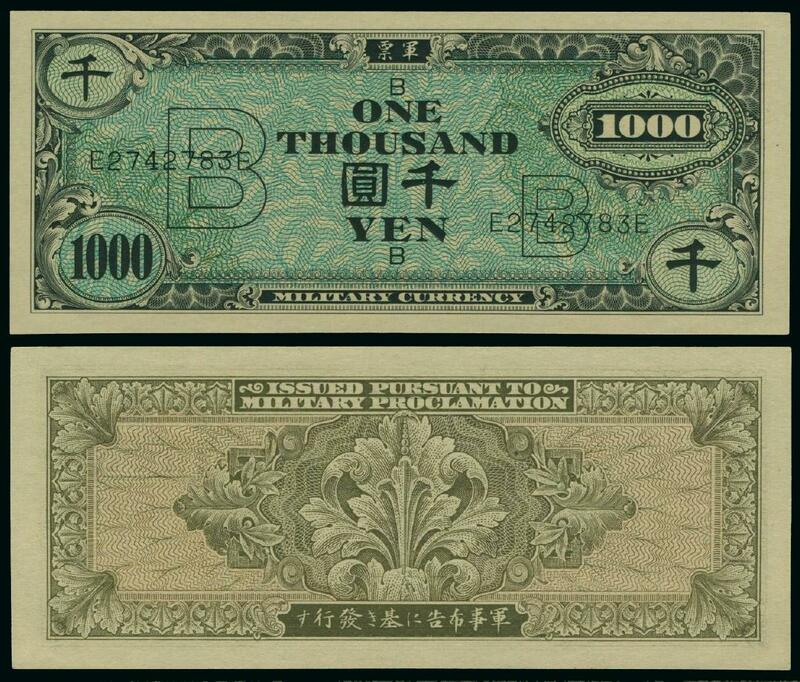 At this point, months of planning came to fruition as the monumental logistical task was undertaken of distributing 90 tons of money to over 830,000 Ryukyuans on some 15 islands and to approximately 15,000 U. S. Forces personnel, and withdrawing, verifying and destroying the type "B" Yen in circulation, and verifying and destroying the substantial amounts of unissued type "B" Yen held in reserve. 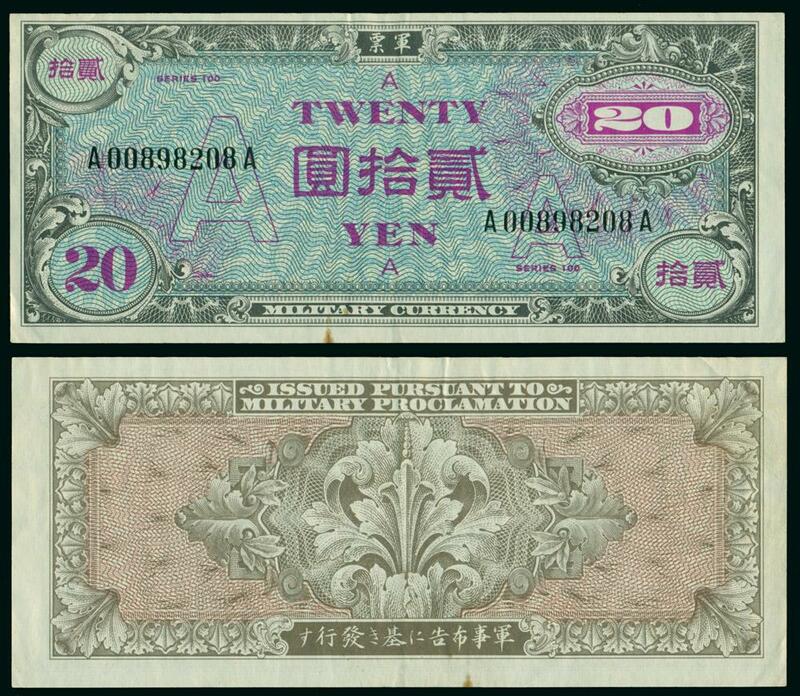 The plan established the Bank of the Ryukyus as the principal agent of the USCAR Funding Officer. 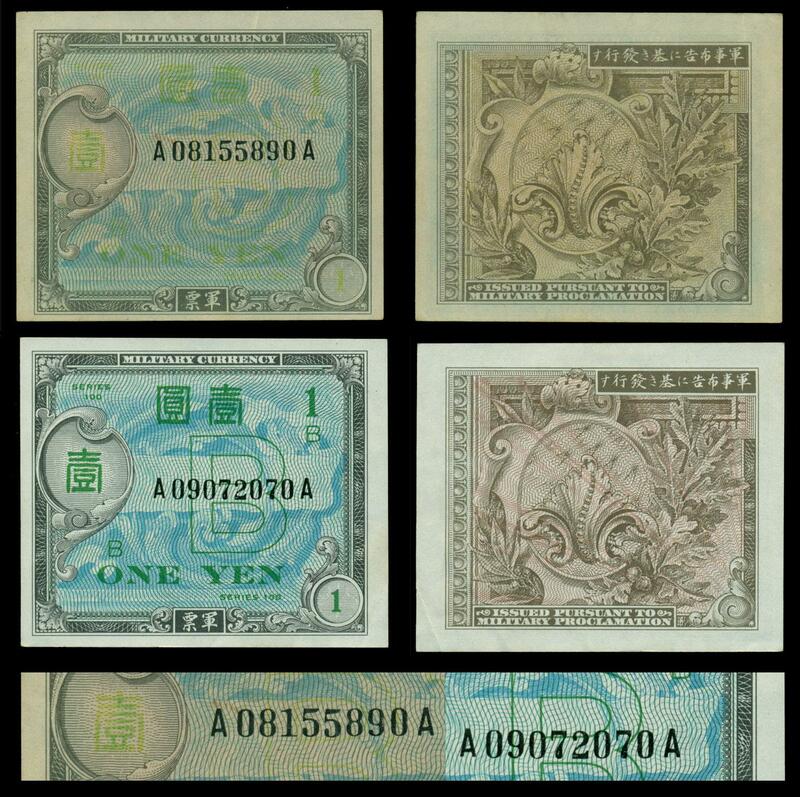 The bank in turn, distributed currency to almost 150 central and branch offices of Ryukyuan post offices, and banks and other financial institutions. 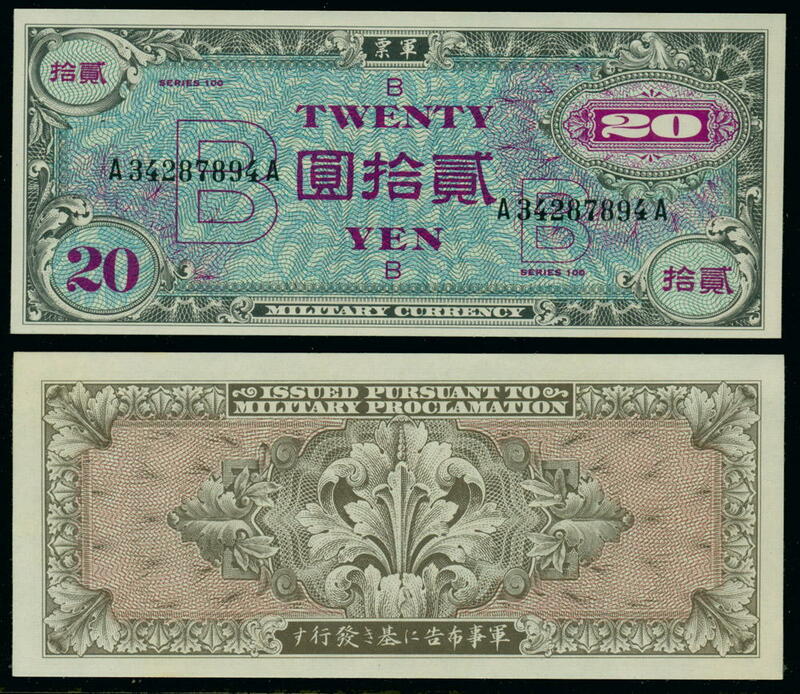 The military forces provided armed guards to augment the protection afforded by Ryukyuan police and transported currency and tellers in trucks, boats, aircraft and helicopters. 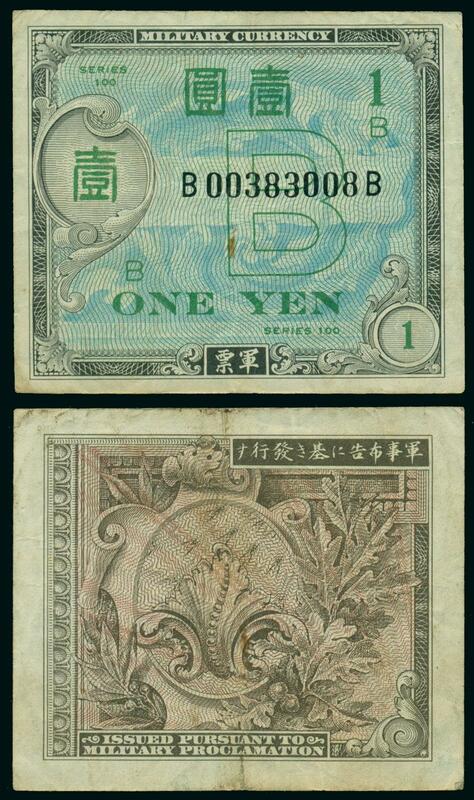 In addition, uniformed personnel verified the type "B" Yen collected, sealed it in large concrete blocks after covering it with indelible red dye, and dumped these blocks into the sea at unrecoverable depths. 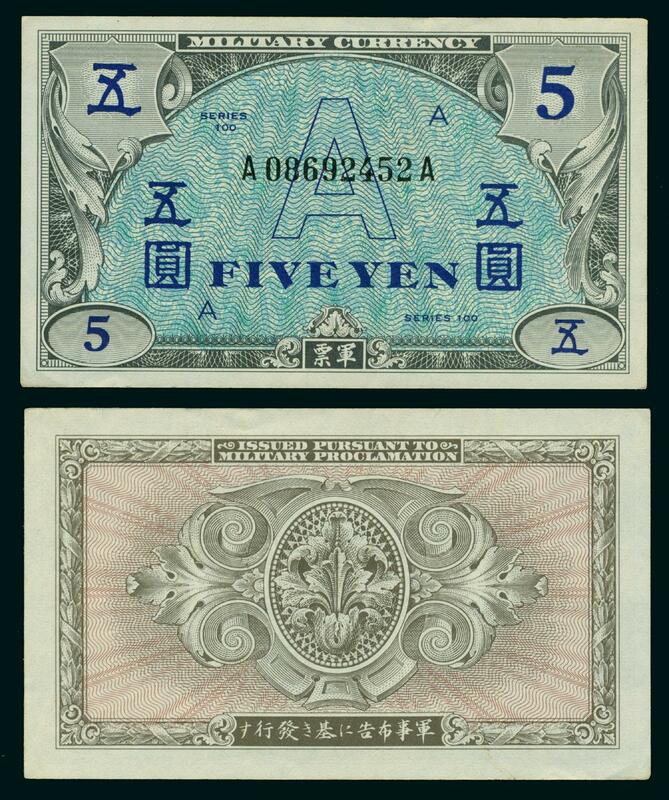 (Emphasis added) (Source: Civil Affairs Activities in the Ryukyu Islands for the Period Ending 30 September 1958, Volume VI Number II, Published by United States Civil Administration of the Ryukyu Islands) (Information provided courtesy of Donn Cuson Remembering Okinawa History). 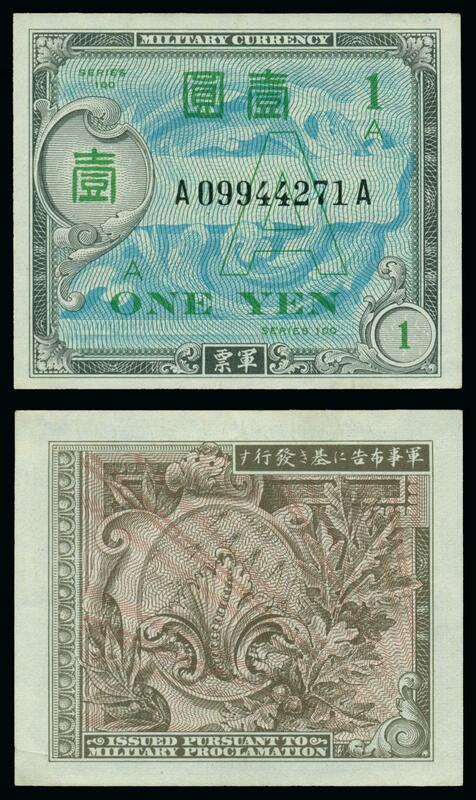 The "A" and "B" yen notes are catalogued/discussed in the below references. 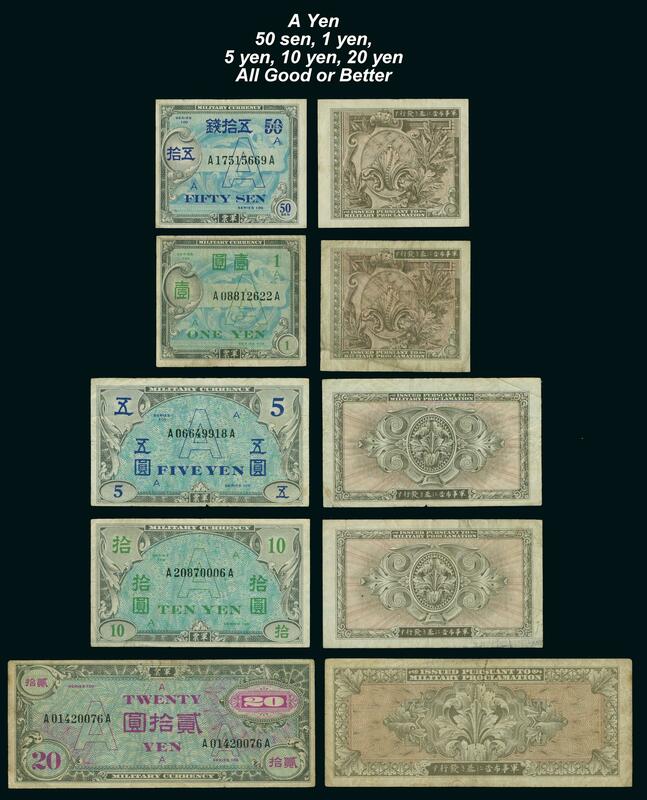 Standard Catalog of World Paper Money, General Issues, Volume Two, by Albert Pick, Seventh Edition, 1994, Krause Publications, Inc., WI, 4to, illustrated hard boards, 1280 pp. 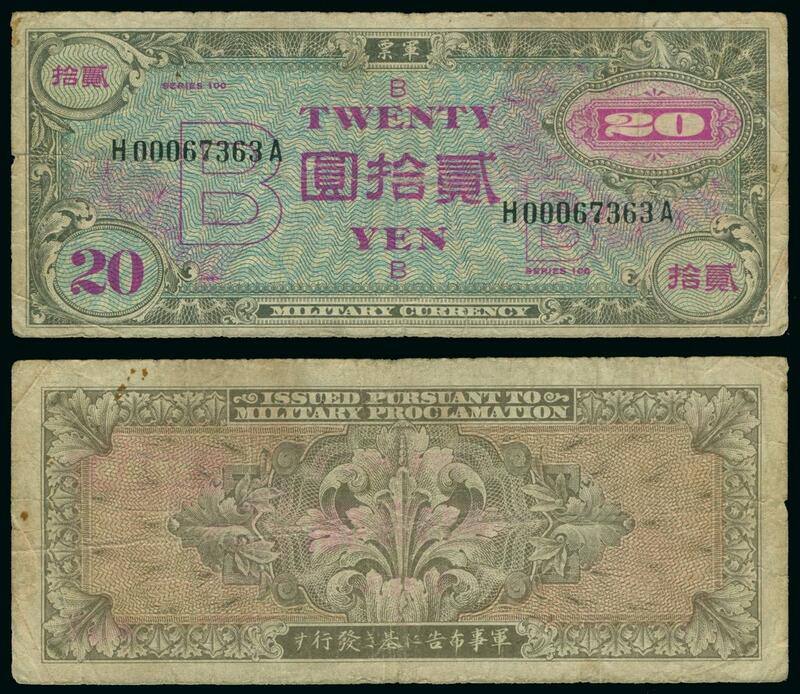 The notes are listed under Japan as "Allied Military Currency" and fall within the Japan notes with Pick numbers 62-76. 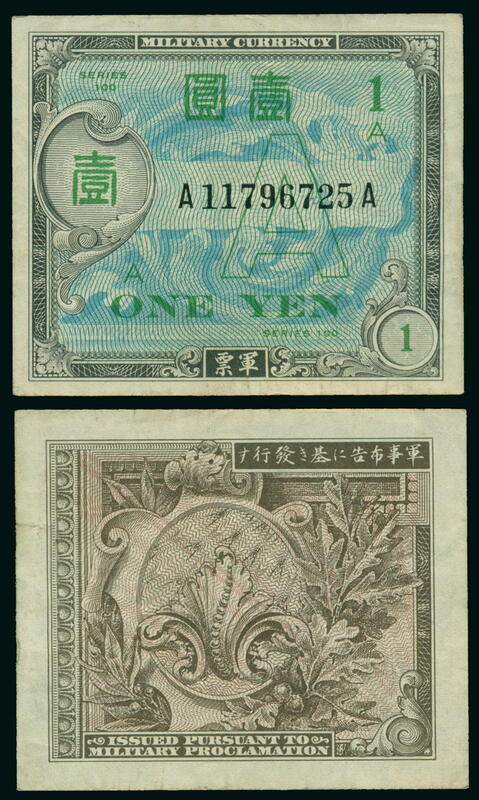 The listing includes values. 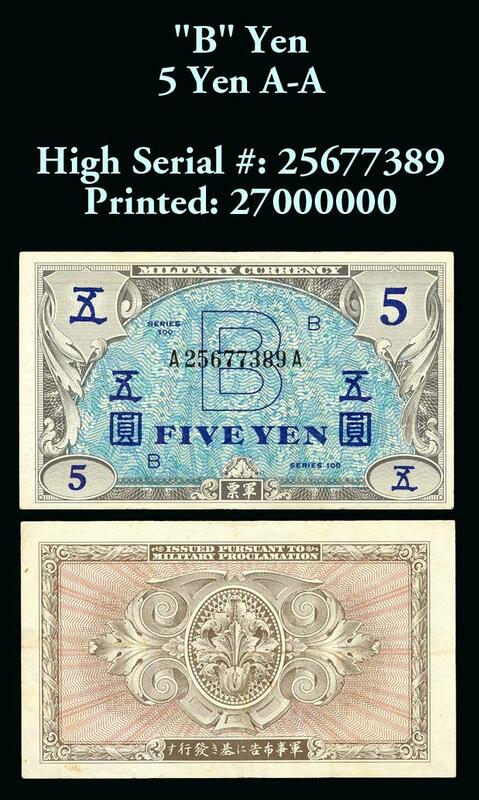 World War II Remembered, history in your hands - a numismatic study by C. Frederick Schwan and Joseph E. Boling, 1995, BNR Press, Ohio, 4to, illustrated hard covers, 864 pp. 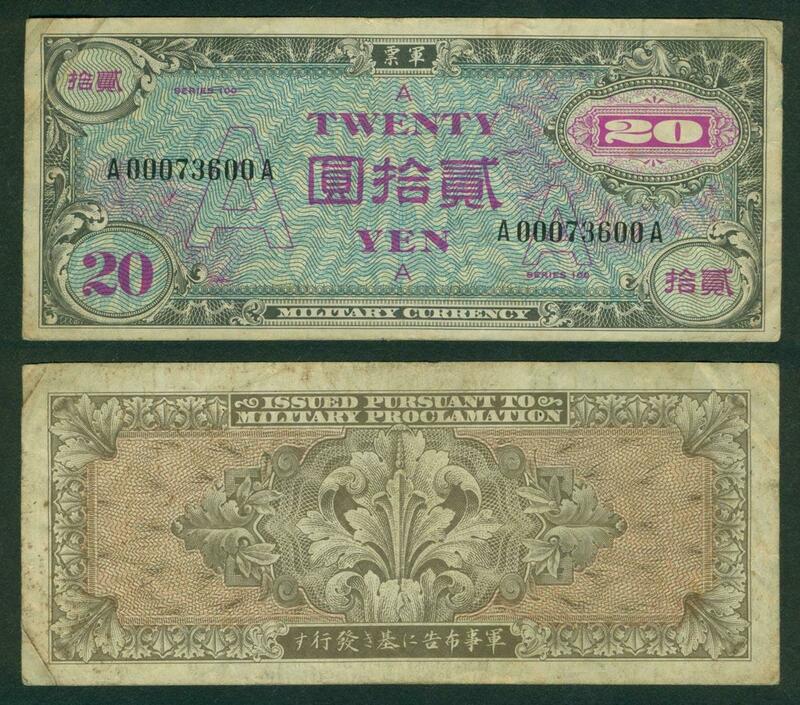 The notes are listed as "Allied Military Currency--Operation Toy Horse" (pages 290-292) and carry Schwan/Boling (SB) numbers 251-58 ("A" yen) and 261-9 ("B" yen). 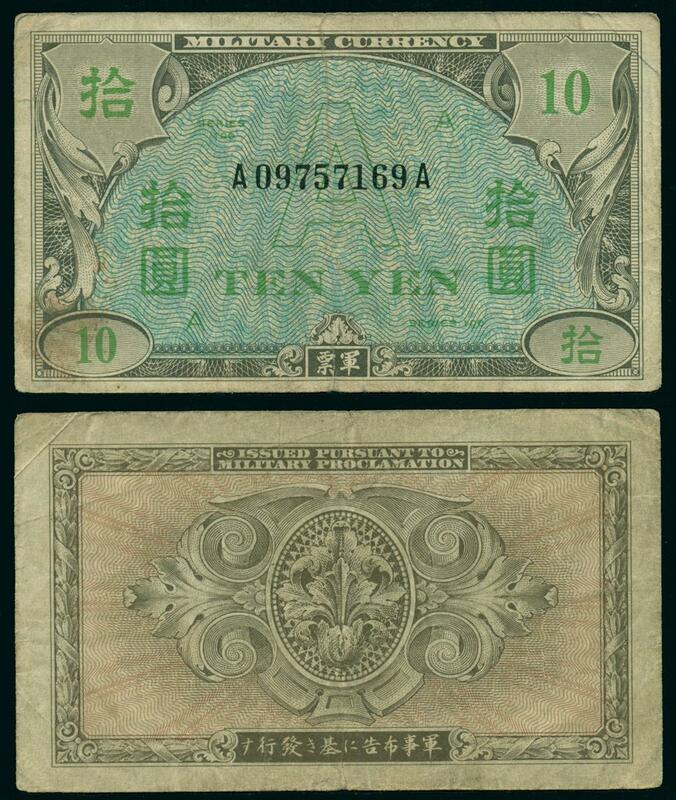 The listing includes values. 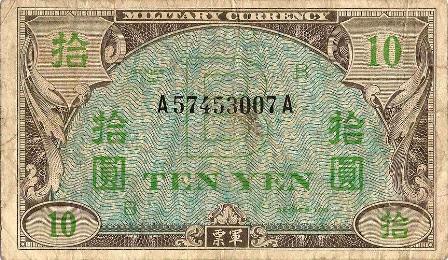 Military Currency: The B-yen, 1945-1958 by Belmont Faries, published in From the Dragon's Den, Volume 12, No 2, June, 1980, pages 52-61. 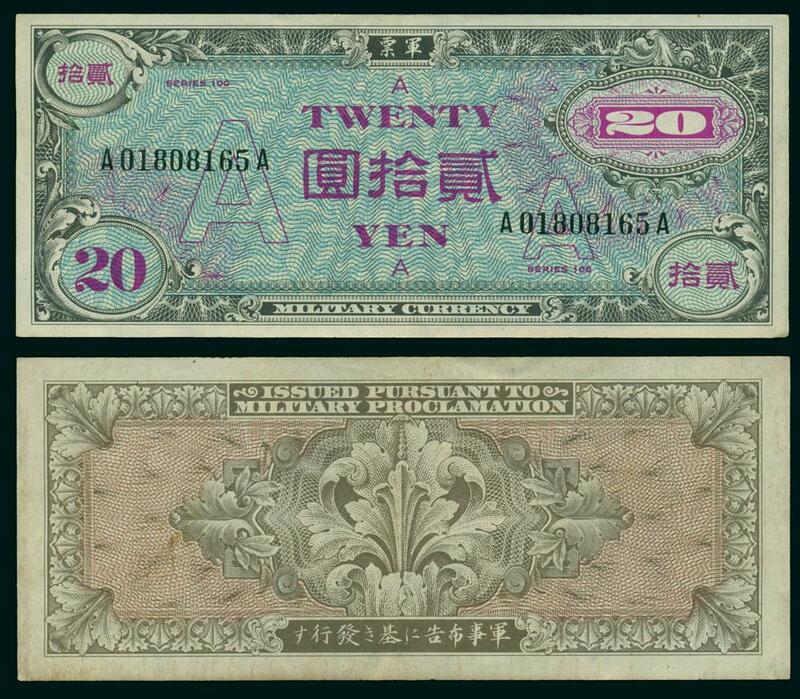 The article is a comprehensive study of this topic and includes a note by note table listing denomination, year printed, printer, block letters, and quantity printed. 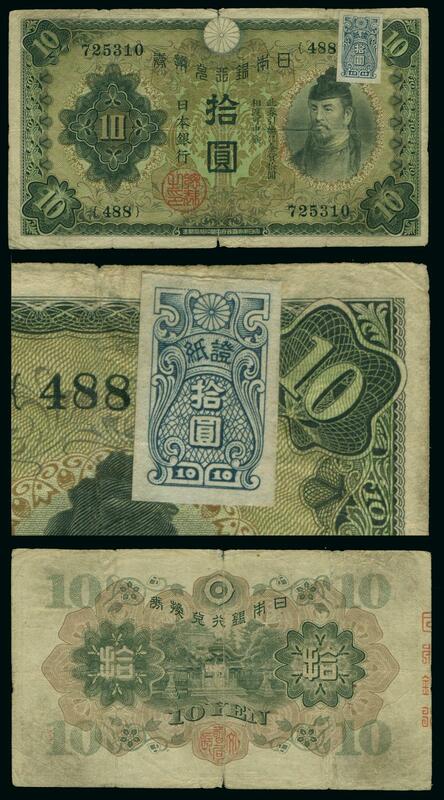 Revalidated with Shoshi - Old Japanese yen Notes. 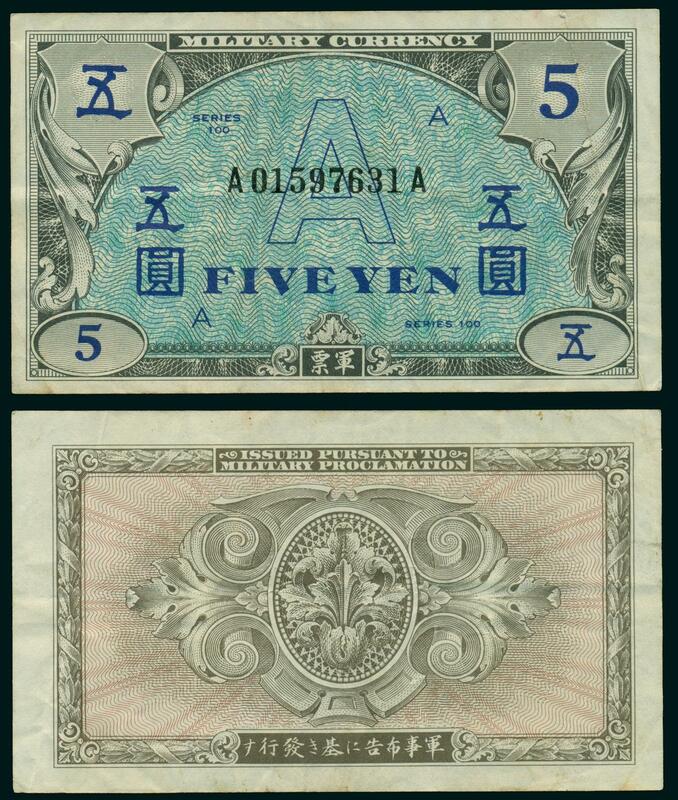 In March of 1946 all Japanese notes of 5 yen or more in denomination were declared invalid effective April 28, 1946. 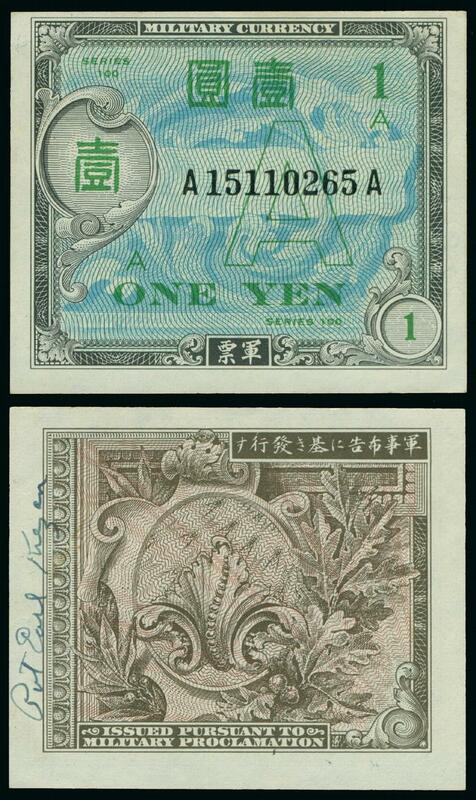 Between April 15 and April 28 the soon to be demonetized notes could be exchanged "New" issue Bank of Japan notes or be revalidated. 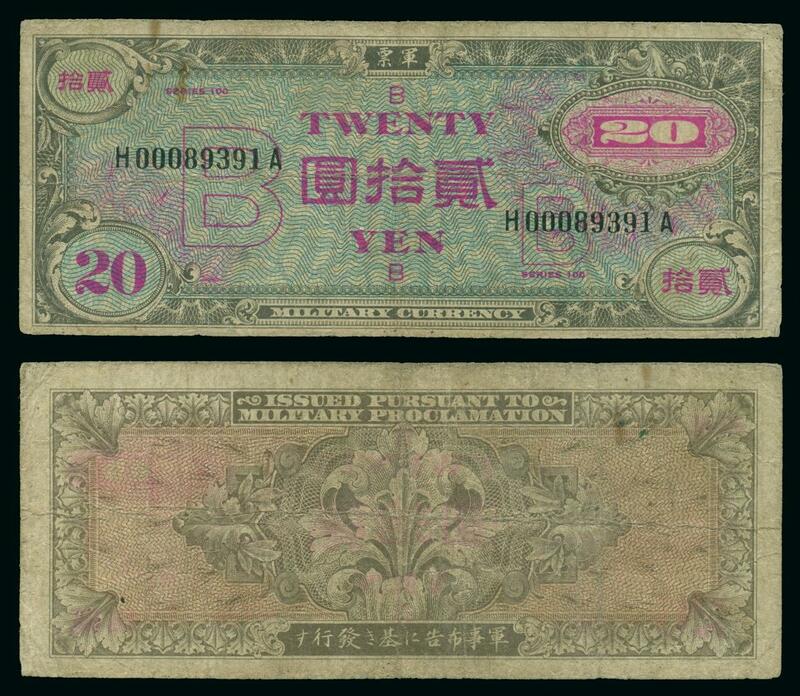 The "revalidated/revalued notes" carried an adhesive revalidation sticker (shoshi) that was affixed in the area at the upper right corner of the note. 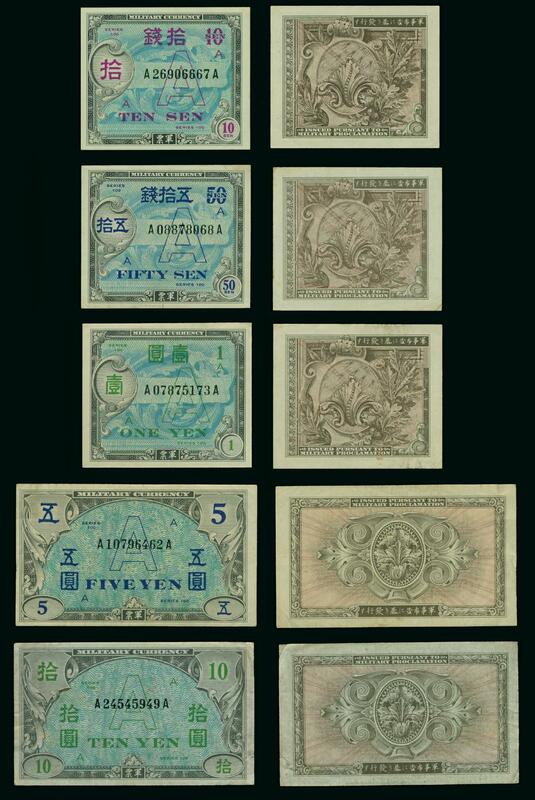 The revalidated notes are found in the 10y, 100y, 200y and 1000y denominations. 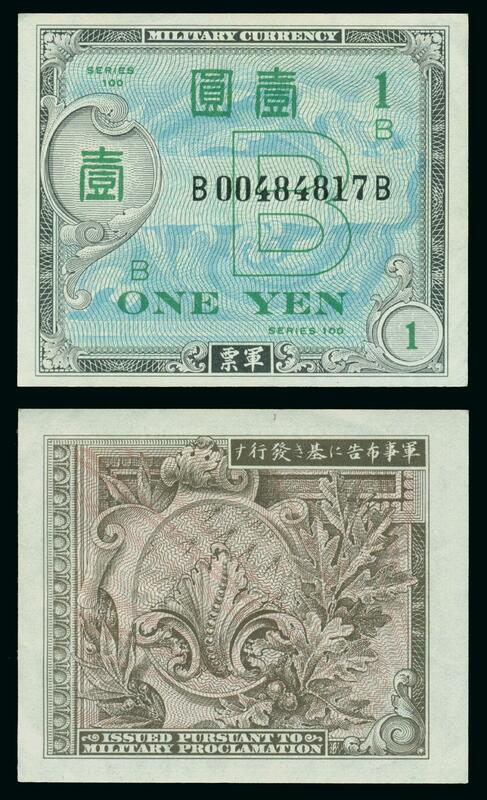 The 1000y and 200y shoshi are quite scarce and almost never actually found affixed to a note. For information on these revalidation/revalue stickers click here. 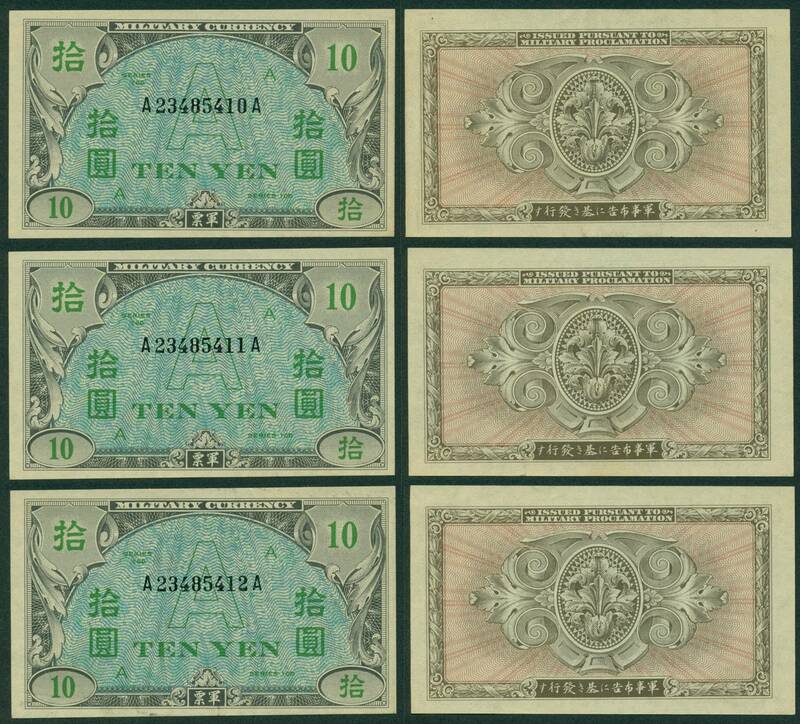 These "revalidated" notes are listed in the Standard Catalogue of World Paper Money (Pick catalogue) as the Japan "1946 Provisional Issue" and assigned catalogue numbers of 79 (10y), 80 (100y), 81 (200y) and 82 (1000y). 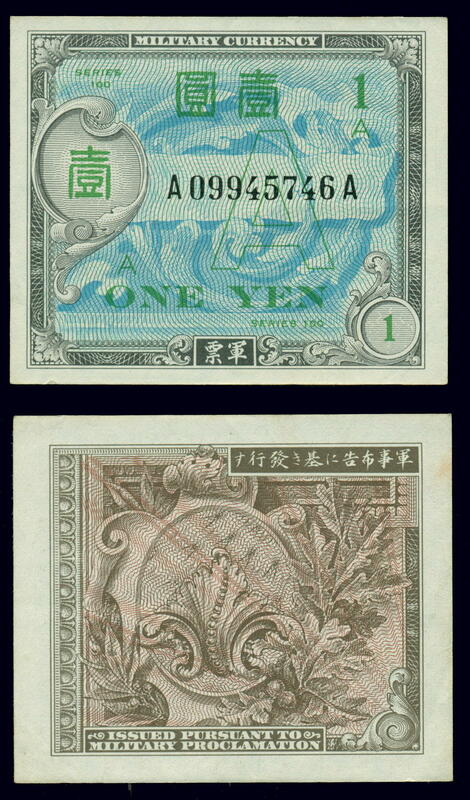 This revalidation was required in Japan and in the Ryukyu Islands. 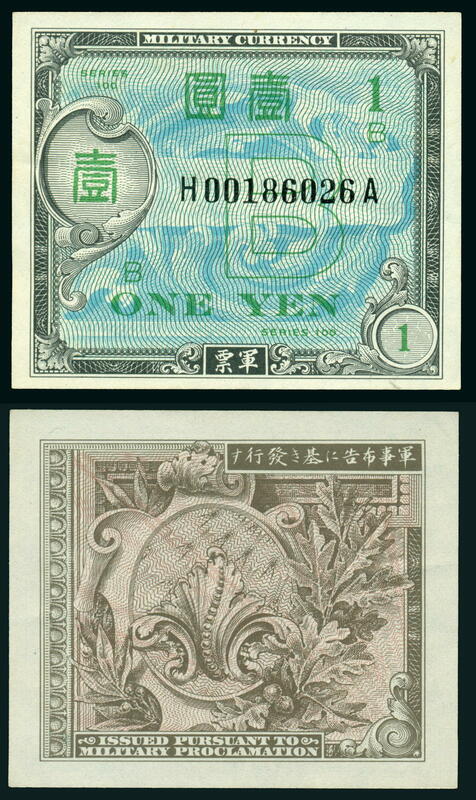 Return to: Ryukyu Stamps Japan Stamps.